Polycomb group (PcG) proteins assemble into heterogeneous Polycomb Repressive Complexes (PRCs), of which there are two main, functionally distinct classes, each with different histone modifying activities. PRC1s mediate the mono-ubiquitylation of histone H2A at Lys119 (K119) (generating H2AK119Ub1), whereas PRC2s di- and tri-methylate K27 of histone H3 (H3K27me2/3) (Blackledge et al., 2015; Di Croce and Helin, 2013; Schwartz and Pirrotta, 2013). There are six PRC1s, each defined by one of six different Polycomb group RING finger proteins (PCGF1-6), which belong to the super-family of RING finger (RNF) ubiquitin ligases (Gao et al., 2012). Although PCGFs have a RING finger domain, they are unable to ubiquitylate H2A; instead, PCGFs dimerize with and activate one of two additional RNF ubiquitin ligases, RNF1 or RNF2, (also known as RING1A and RING1B, respectively), which in turn ubiquitylate H2A (Cao et al., 2005; de Napoles et al., 2004; Wang et al., 2004). Based on the presence or absence of chromobox-containing protein (CBX) subunits, the six PRC1s are further sub-categorized into two canonical (cPRC1) and four non-canonical (ncPRC1) complexes, respectively. The best-characterized ncPRC1 is ncPRC1.1 (also known as variant PRC1.1), which contains a core ubiquitin ligase complex, the FRRUC, which comprises the PCGF protein RNF68 (also known as PCGF1 and NSPC1), RNF2, and the short isoform (which misses the JmjC domain) of the F-box protein FBXL10 (also known as FBL10, JHDM1B, KDM2B, and NDY1) (Gearhart et al., 2006; Inagaki et al., 2015; Oliviero et al., 2015; Sánchez et al., 2007; Wu et al., 2013). The FRRUC mono-ubiquitylates H2A on K119, repressing genes that are important for differentiation and development (Cao et al., 2005; Endoh et al., 2012; Gearhart et al., 2006; He et al., 2008; Wang et al., 2004; Wu et al., 2013). Mono-ubiquitylation of K119 in H2A and K120 in H2A.X has also been detected at DNA lesions such as double-strand breaks (DSBs) (Bergink et al., 2006; Ginjala et al., 2011; Kakarougkas et al., 2014; Pan et al., 2011; Shanbhag et al., 2010; Ui et al., 2015). The DSB-induced mono-ubiquitylation of H2A is thought to promote transcriptional repression at sites of DSBs (Kakarougkas et al., 2014; Shanbhag et al., 2010; Ui et al., 2015). Two dimeric ubiquitin ligases (BMI1-RNF2 and MEL18-RNF2 also know as RNF51-RNF2 and RNF110-RNF2, respectively), which are components of two distinct cPRC1s, have been implicated in the mono-ubiquitylation of K119 and K120 in H2A and H2A.X in response to genotoxic stress (Bergink et al., 2006; Ginjala et al., 2011; Gracheva et al., 2016; Ismail et al., 2010; Pan et al., 2011). However, whether ncPRC1s, which in transcription regulation are required for the ubiquitylation of H2A via cPRC1s (Blackledge et al., 2014, 2015; Cooper et al., 2014), are also necessary in response to DNA damage has remained unknown. We found that the FRRUC is rapidly and transiently recruited to sites of DNA damage in a PARP1-and TIMELESS-dependent manner and determined the biological significance of this recruitment as described below. FBXL10, RNF68, and RNF2 are three subunits of a ubiquitin ligase complex, named FRRUC for short (Gearhart et al., 2006; Sánchez et al., 2007; Wu et al., 2013). We confirmed that the three proteins exist in a trimeric complex by performing sequential co-precipitation experiments in which we found that FBXL10-interacting RNF2 also interacted with RNF68 (Figure 1—figure supplement 1A). In unstressed cells, mono-ubiquitylation of K119 in H2A via the FRRUC, which serves as the core ubiquitin ligase of ncPRC1.1, is required for the recruitment of cPRC1s to maintain the mono-ubiquitylation of H2A (Blackledge et al., 2015; Cooper et al., 2014). Certain cPRC1s have been shown to be recruited to DNA lesions and mono-ubiquitylate H2A and H2A.X (Bergink et al., 2006; Ginjala et al., 2011; Gracheva et al., 2016; Ismail et al., 2010; Pan et al., 2011). Therefore, we asked whether the FRRUC is also recruited. Local DNA damage was introduced into human U-2OS cells by 405 nm laser micro-irradiation, as previously described (Altmeyer et al., 2015; Young et al., 2015). The track of DNA damage was then visualized by γH2A.X staining. We found that endogenous FBXL10, RNF68, and RNF2 recruited to sites of DNA damage and co-localized with γH2A.X (Figure 1—figure supplement 1B). To use a different imaging method that is especially advantageous for detecting and quantifying localization patterns and protein complexes in dense structures, such as nuclei (Ricci et al., 2015; Yin and Rothenberg, 2016), we used dual-color single-molecule localization microscopy (direct STochastic Optical Reconstruction Microscopy or dSTORM) to evaluate the enrichment of the FRRUC at DNA damage sites in U-2OS cells upon treatment with the radiomimetic agent, neocarzinostatin (NCS), which induces single and double stranded breaks. As a DNA marker we used XRCC5, a highly abundant protein that is rapidly recruited to DSBs since, although it has intrinsic affinity for DNA, it has even higher affinity for DNA ends. [XRCC5 is recruited very rapidly before the choice of homologous recombination repair ﻿(HHR)﻿ v. non-homologous end joining (NHEJ) is made by the cell.] Because it associates with chromatin in both undamaged and damaged cells, XRCC5 is an ideal marker to evaluate cross-correlation changes with other DNA-binding proteins in response to DNA damage (Britton et al., 2013; Reid et al., 2015; Teixeira-Silva et al., 2017; Walker et al., 2001). Figure 1A shows representative overlaps between FBXL10, RNF68, or RNF2 and XRCC5 with or without NCS treatment. Since in dense images, it is possible that two species randomly overlap with each other, we analyzed all images using a cross-correlation method that probes the probability distributions across all possible pair-wise distances between two species taking in account, at the same time, the amount of each species (Coltharp et al., 2014; Veatch et al., 2012). We observed a significant increase in cross-correlation signal between FBXL10, RNF68, or RNF2 and XRCC5, upon NCS treatment (Figure 1B), showing an enrichment of the FRRUC at sites of DNA damage in agreement with the results obtained with laser micro-irradiation. FBXL10, RNF68, and RNF2 are recruited to sites of DNA damage in a PARP1- and TIMELESS- dependent manner. (A) Super-resolution imaging was performed in U-2OS cells to analyze the colocalization between XRCC5 (magenta) and FBXL10, RNF68 and RNF2 (green), with or without 20 min of NCS treatment. Representative nuclei are shown. A white dash line denotes the border of each nucleus. Scale bar represents 2.5 μm. The signal overlap (white) demonstrates the colocalization between XRCC5 and FBXL10, RNF68 or RNF2. (B) The graphs display the correlation between XRCC5 and FBXL10 (NCS-, n = 113; NCS+, n = 109), RNF68 (NCS-, n = 254; NCS+, n = 232) or RNF2 (NCS-, n = 128; NCS+, n = 105) in individual nuclei, respectively. Each plot is the correlation amplitude between XRCC5 and FBXL10/RNF68/RNF2 within one nucleus. The n value representing the total number of analyzed nuclei is pooled from the three or four independent experiments. A.U., arbitrary units. Whisker box shows mean and S.D. values. P values were calculated using two-sample t-test between NCS - and NCS + samples. (C) U-2OS cells stably expressing GFP-FBXL10 (left), mCherry-RNF68 (middle) or GFP-RNF2 (right) were transfected with siRNAs targeting PARP1, TIMELESS, or a non-targeting control (CTRL). Cells were pre-sensitized with BrdU (10 μM) for 36 hr and subjected to 405 nm laser induced damage. Where indicated, cells were pretreated with 1 μM PARP inhibitor (Olaparib) for 1 hr. DNA damage recruitment dynamics were captured by live cell imaging. Relative fluorescence values and images were acquired every 5 s for 4 min. For each condition, ≥25 cells were evaluated from 2 or three independent experiments. Mean relative fluorescence values and standard errors were plotted against time. Representative images are shown in Figure 1—figure supplement 2A. Times are indicated in seconds. The efficiency of PARP1 and TIMELESS depletion is shown using immunoblotting. 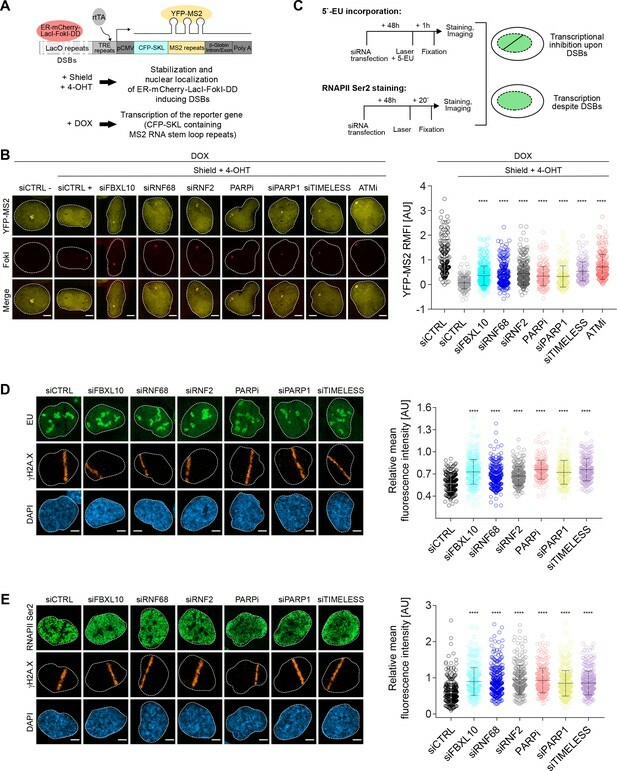 To examine the spatiotemporal dynamics of FBXL10, RNF68, and RNF2 after DNA damage in living cells, we generated cells stably expressing fluorescent protein-tagged versions of these three proteins under the control of a weak LTR promoter. In living cells, FBXL10 was localized to the nucleoplasm with an enrichment in the nucleolus (Figure 1—figure supplement 2A), as previously reported both in mammalian and insect cells (Frescas et al., 2007; Kavi and Birchler, 2009). Whereas RNF68 displayed a localization similar to that of FBXL10, RNF2 showed a more homogenous nuclear distribution (Figure 1—figure supplement 2A), likely due to the fact that RNF2 can participate in all six PRC1s. Often DDR proteins are sequestered into the nucleolus and redistributed to sites of DNA repair in response to genotoxic stress (Antoniali et al., 2014; Lindström et al., 2018). When we tested the recruitment to laser-induced ‘DNA damage spots’ (Young et al., 2015), we found that GFP-FBXL10, mCherry-RNF68, and GFP-tagged RNF2 were recruited within seconds to these spots (Figure 1C). The peak of recruitment was reached by approximately within one minute post-irradiation, after which the signal progressively decreased (Figure 1C). Figure 1—figure supplement 2A shows representative examples of recruitment of these three proteins. We noticed that whereas the kinetics of disappearance of FBXL10 and RNF68 were comparable, RNF2 remained at DNA lesions for longer, likely because of its presence in both cPRC1s and ncPRC1s. Notably, no recruitment of FBXL11 (also known as FBL11, JHDM1A, and KDM2A), a close paralog of FBXL10 that does not bind RNF2 and RNF68 (Figure 1—figure supplement 2B), was observed (Figure 1—figure supplement 2C), suggesting that FBXL10 plays a specific role in the DDR. To test whether the recruitment of the FRRUC to sites of DNA damage depends on known DNA damage signaling enzymes, we evaluated the recruitment of the three subunits upon treatment of cells with small molecules to inhibit ATM (with KU60018), ATR (with AZ20), DNA-PK (with NU7441), and PARP (with Olaparib)(Figure 1C and Figure 1—figure supplement 2A,D). Only the inhibition of PARP [Poly(ADP-ribose) polymerase] with Olaparib completely abolished the recruitment of the FRRUC to sites of DNA damage (Figure 1C and Figure 1—figure supplement 2A,D). We did not observe recruitment of FBXL10 upon PARP inhibition up to 30 min after laser micro-irradiation (Figure 1—figure supplement 3A). Importantly, inhibition of PARP with Olaparib also abolished the recruitment of endogenous proteins (Figure 1—figure supplement 1B). PARP1 is a critical sensor of DNA damage lesions, catalyzing the production of long chains of branched poly(ADP)ribose on target proteins during the DNA damage response (DDR) (Li and Yu, 2015). PARylation is one of the earliest post-translational modifications in response to DNA lesions, occurring on substrates such as histones, certain DNA repair factors, and PARP1 itself (Rouleau et al., 2010). We, and others, have shown that TIMELESS forms a near stoichiometric complex with PARP1 (Xie et al., 2015; Young et al., 2015). Therefore, we monitored the recruitment of the FRRUC to sites of DNA damage after silencing either PARP1 or TIMELESS, finding that the recruitment of all three proteins was abolished after depletion of either PARP1 or TIMELESS (Figure 1C and Figure 1—figure supplement 2A). In contrast, the recruitment of other DNA repair factors, such as XRCC1 and Ligase 3, which are affected by PARP1 silencing (Campalans et al., 2013; Godon et al., 2008; Mortusewicz et al., 2006; Okano et al., 2003), were not affected by TIMELESS depletion (Figure 1—figure supplement 3B). Collectively, our results demonstrate that the PARP1-TIMELESS complex promotes the rapid recruitment of the FRRUC to sites of DNA damage, suggesting an early role for this ubiquitin ligase complex in the response to DNA damage. Since two dimeric ubiquitin ligases (RNF51-RNF2 and RNF110-RNF2), which are component of two distinct cPRC1s, have been shown to recruit to DNA lesions and mono-ubiquitylate H2A (Bergink et al., 2006; Ginjala et al., 2011; Gracheva et al., 2016; Ismail et al., 2010; Pan et al., 2011), we asked whether the recruitment of the FRRUC depends on the recruitment of these cPRC1 components. We found that the recruitment of FBXL10 and RNF68 was not affected by the depletion of either RNF51 (also called BMI1 or PCGF4) or RNF110 (also called MEL18 or PCGF2) (Figure 2A-and Figure 2—figure supplement 1A). The recruitment of RNF2 was partially inhibited by the depletion of either RNF51, RNF110, or RNF68, likely because of its presence in both cPRC1s and ncPRC1s. Both GFP-tagged RNF51 and RNF110 recruited to laser induced DNA damage sites which peeks approximately around ~75 s post-irradiation and they remain at DNA lesions longer than FBXL10 and RNF68. We found that the recruitment of RNF51 and RNF110 depends on PARP1 and TIMELESS presence as well as PARP1 activity (Figure 2B–C-and Figure 2—figure supplement 1B). PARP1-, TIMELESS-, and RNF68-dependent recruitment of the cPRC1 subunits, RNF51 and RNF110. (A) U-2OS cells stably expressing GFP-FBXL10 (left), mCherry-RNF68 (middle) or GFP-RNF2 (right) were transfected with siRNAs targeting RNF51, RNF110 or a non-targeting control (CTRL). Cells were pre-sensitized with BrdU (10 μM) for 36 hr and subjected to 405 nm laser induced damage. DNA damage recruitment dynamics were captured by live cell imaging. Relative fluorescence values and images were acquired every 5 s for 4 min. For each condition,≥35 cells were evaluated from 2 or three independent experiments. Mean relative fluorescence values and standard errors were plotted against time. Representative images are shown in Figure 2—figure supplement 1A. Times are indicated in seconds. The efficiency of RNF51, RNF110 and RNF68 depletion is shown using immunoblotting. (B) Left: U-2OS cells stably expressing GFP-RNF51 were transfected with siRNAs targeting PARP1, TIMELESS or a non-targeting control (CTRL). Right: U-2OS cells engineered to express FLAG-HA-tagged RNF68, RNF68(ΔRING) or RNF68(Y252D) in combination with GFP-RNF51 were transfected with siRNAs targeting the 3’ UTR of RNF68 (siRNF68 seq2). Cells were pre-sensitized with BrdU (10 μM) for 36 hr and subjected to 405 nm laser induced damage. Where indicated, cells were pretreated with 1 μM PARP inhibitor (Olaparib) for 1 hr. DNA damage recruitment dynamics were captured by live cell imaging. Relative fluorescence values and images were acquired every 5 s for 4 min. For each condition, ≥35 cells were evaluated from 2 or three independent experiments. Mean relative fluorescence values and standard errors were plotted against time. CTRL sample set is the same on both graphs. Representative images are shown in Figure 2—figure supplement 1B. Times are indicated in seconds. The efficiency of PARP1, TIMELESS and RNF68 depletion and over-expression of the FLAG-HA-tagged RNF68 rescue constructs is shown using immunoblotting. Upper arrow indicates FLAG-HA-tagged RNF68 and RNF68(Y252D), middle arrow indicates RNF68(ΔRING) while lower arrow corresponds to endogenous RNF68. (C) Same as in (B) but using U-2OS cells stably expressing GFP-RNF110. To test whether the FRRUC regulates the recruitment of RNF51 and RNF110, we silenced RNF68 since RNF68 is the specific PCGF subunit that defines ncPRC1.1 and has not been identified in other protein complexes as FBXL10 and RNF2 (Gao et al., 2012; Sánchez et al., 2007; Wong et al., 2016). We found that the recruitment of RNF51 and RNF110 was inhibited by the depletion of RNF68 (Figure 2B–C- and Figure 2—figure supplement 1B). To control for off-target effects, we set to rescue the recruitment of RNF51 and RNF110 by complementation with siRNA-resistant constructs of RNF68. In addition to wild-type RNF68, we sought to use inactive RNF68 mutants; so, we used a panel of truncation mutants to identify the minimal region that supports the interaction of RNF68 with FBXL10 and RNF2. We found that four amino acids at position 251–254 of human RNF68 (QYSV) are essential for a stable binding with FBXL10 (Figure 2—figure supplement 2). Further refinement of the interaction surface between RNF68 and FBXL10 indicated that mutation of tyrosine 252 to aspartic acid [generating RNF68(Y252D)] significantly reduced RNF68’s binding to FBXL10 without affecting its interaction with RNF2 (Figure 2—figure supplement 2). In contrast, mutation of Y252 to alanine [generating RNF68(Y252A)] had no effect on RNF68’s interaction with FBXL10. Deletion of the RING domain of RNF68 [creating RNF68(ΔRING)] completely abrogated its binding to RNF2, while leaving its interaction with FBXL10 intact (Figure 2—figure supplement 2), indicating that RNF2 is not required for the interaction between FBXL10 and RNF68, in agreement with the crystal structure of the minimal version of ncPRC1.1 (Wong et al., 2016). We found that wild-type RNF68, but not RNF68 inactive mutants, partially prevented the inhibition of RNF51’s and RNF110’s recruitment due to RNF68 silencing (Figure 2B–C and Figure 2—figure supplement 1B). These results demonstrate that RNF68’s interaction with both RNF2 and FBXL10, which is required form an active FRRUC, is necessary for the proper recruitment of RNF51 and RNF110. 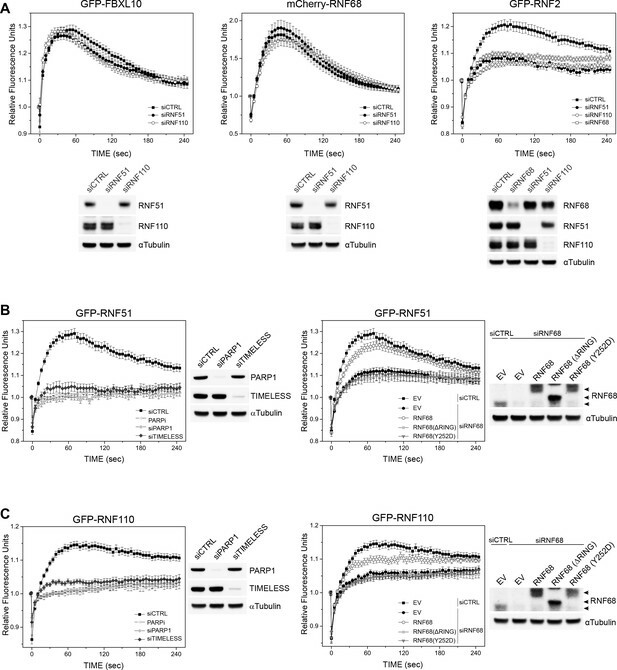 Thus, it appears that an active FRRUC is necessary for the proper recruitment of cPRC1 complexes, similarly to what was previously shown for transcriptional repression in unperturbed cells. Since the FRRUC mono-ubiquitylates H2A on K119 in unstressed cells, we monitored the ability of FBXL10, RNF68, and RNF2 to regulate the ubiquitylation of H2A on Lys119 at sites of laser-induced DNA damage. Knocking down either FBXL10, RNF68, or RNF2 (Figure 3—figure supplement 1A) resulted in a significant reduction of H2AK119Ub1 staining on the laser damage tracks compared to control samples (Figure 3A). Likewise, silencing PARP1 or TIMELESS, which are required for proper localization of the complex, or inhibition of PARP, resulted in a decrease in H2AK119Ub1 levels at sites of DNA damage (Figure 3A). The FRRUC is required for H2A-ubiquitylation at sites of DNA damage. (A) U-2OS cells were transfected with the indicated siRNAs. Cells were fixed 30 min after laser microirradiation and stained with antibodies to γH2A.X (orange) and H2AK119Ub1 (green). Scale bar represents 5 μm. The graph represents the mean intensity of the H2AK119Ub1 signal on the γH2A.X track, normalized to the mean values of the siCTRL sample. At least 28 laser stripes were analyzed per condition from 2 or three independent experiments. A white dash line denotes the border of each nucleus. Error bars represent S.E.M. Differences relative to siCTRL were calculated using one-way ANOVA. ****p≤0.0001, ***p≤0.001, **p≤0.01, *p≤0.05, ns = not significant. (B) U-2OS cells engineered to express FLAG-HA-tagged RNF68, RNF68(ΔRING) or RNF68(Y252D) were transfected with siRNAs targeting the 3’ UTR of RNF68 (siRNF68 seq2). Cells were fixed 30 min after laser microirradiation and stained with antibodies to γH2A.X (orange) and H2AK119Ub1 (green). Scale bar represents 5 μm. The graph represents the mean intensity of the H2AK119Ub1 signal on the γH2A.X track, normalized to the mean values of the siCTRL sample. At least 30 laser stripes were analyzed per condition from 2 or three independent experiments. A white dash line denotes the border of each nucleus. Error bars represent S.E.M. Differences relative to siCTRL were calculated using one-way ANOVA. ****p≤0.0001, ***p≤0.001, **p≤0.01, *p≤0.05, ns = not significant. (C) Left: Schematic of DSB generation by ER-mCherry-LacI-FokI-DD at lac operator (LacO) repeats integrated into the genome of U-2OS DSB reporter cells. The ER-mCherry-LacI-FokI-DD is stabilized by Shield1 and targeted to the nucleus by 4-OHT. The qChIP primer sets around the induced DSBs are labeled as p1-p2. ER, estrogen receptor; DD, destabilization domain. The ER-mCherry-LacI-FokI-DD nuclease was induced for 1 hr using Shield-1 and 4-OHT. Right: qChIP was performed in FokI reporter U-2OS cells with and without FokI-induced DSBs using antibodies to H2A and ubiquitylated H2A. To determine the relative amount of mono-ubiquitylated H2A, H2AK119Ub1 values were normalized on total H2A values. Error bars represent S.E.M from ≥3 independent experiments. P values were calculated using one-way ANOVA. ****p≤0.0001, ***p≤0.001, **p≤0.01, *p≤0.05, ns = not significant. In order to control for off-target effects, we sought to rescue the H2AK119Ub1 levels phenotype by complementation of siRNA-resistant constructs. We focused on rescuing the effect of RNF68 depletion since RNF68 is the specific PCGF subunit that defines the ncPRC1.1 and because RNF68 is the only component of the FRRUC that does not appear to be present in other protein complexes (Gao et al., 2012; Sánchez et al., 2007; Wong et al., 2016). We found that, in contrast to the siRNA-resistant wild type RNF68, neither the siRNA-resistant RNF68(ΔRING) nor the siRNA-resistant RNF68(Y252D) could rescue the defects in H2AK119Ub1 levels at DNA damage sites (Figure 3B). Next, we examined the relative levels of H2AK119Ub1 over H2A at defined DSBs. To this end we utilized a DSB reporter system in U-2OS cells in which DSBs could be generated at a defined genomic locus based on the inducible expression of an ER-mCherry-LacI-FokI-DD nuclease fusion protein (Shanbhag et al., 2010; Tang et al., 2013). This cell line contains the FokI nuclease fused to both a modified estradiol receptor (ER) and a destabilization domain (DD), allowing its inducible nuclear translocation and stabilization after treatment with 4-hydroxytamoxifen (4-OHT) and Shield-1, respectively (Figure 3C). The nuclease then localizes to a lac operon repeat stably integrated into the genome of these engineered U-2OS cells to induce site specific DSBs within the region. Using qChIP with specific primers for a region downstream to the DSBs, we observed that levels of H2AK119Ub1 were induced ~4.2 kbp from the break sites, and to a slightly lesser extent ~10.2 kbp, from the DSB sites (Figure 3C). Depletion of FBXL10, RNF2, or RNF68 (but not of XRCC6, used as a negative control) strongly reduced the amount of H2AK119Ub1 detected at the sites of DSBs (Figure 3C and Figure 3—figure supplement 1B), indicating that these proteins significantly contribute to the mono-ubiquitylation of H2A at K119. The H2AK119Ub1 modification has been strongly associated with transcriptional silencing at DSBs (Kakarougkas et al., 2014; Sanchez et al., 2016, 2010; Ui et al., 2015). Having confirmed that the FRRUC controls the mono-ubiquitylation of H2A on K119 at sites of DNA damage, we examined whether the disruption of the FRRUC affects DSB-mediated transcriptional repression. To this end, we used a previously described transcriptional reporter system (Janicki et al., 2004; Shanbhag et al., 2010). Similar to the experiment shown in Figure 3C, DSBs were induced by activating the ER-mCherry-LacI-FokI-DD fusion protein. In addition, as schematized in Figure 4A, doxycycline (DOX) treatment enabled the transcription of CFP-SKL (CFP-tagged peroxisomal targeting peptide) mRNA that contains MS2 stem loop repeats. The latter, when bound by the stably transfected YFP-tagged MS2 viral coat protein (YFP-MS2), is detected as a yellow dense dot in the nucleus whose fluorescence intensity is quantified by ImageJ. The production of nascent RNA transcript was almost completely abolished in control cells upon the activation of the FokI nuclease (Figure 4B), indicative of transcriptional repression at sites of DNA damage. As previously reported (Shanbhag et al., 2010), ATM inhibition significantly restored transcription near the DSB sites. Depletion or mislocalization of the FRRUC (the latter accomplished through inhibition of PARP or depletion of either PARP1 or TIMELESS) also significantly de-repressed transcription near sites of DSB (Figure 4B and Figure 4—figure supplement 1A). Silencing of FBXL10, RNF68, RNF2, PARP1, or TIMELESS did not have a negative effect on FokI nuclease levels (Figure 4—figure supplement 1A). The FRUCC is required for transcriptional repression at sites of DNA damage. (A) Schematic of the U-2OS reporter system that allows monitoring transcription following induction of DSBs. DSBs are induced in the LacO repeats by activating the ER-mCherry-LacI-FokI-DD fusion protein with Shield-1 and 4-OHT. The transcription of the MS2 stem loop containing CFP-SKL is driven by a minimal CMV promoter and the binding of the tetracycline-controlled transactivator (rtTA) after DOX treatment. Nascent transcript is visualized by the binding of the YFP-MS2 viral coat protein. (B) Transcription activity was measured in U-2OS FokI-YFP-MS2 reporter cells transfected with the indicated siRNAs or inhibitors upon induction of DSBs. Quantification of YFP-MS2 relative mean fluorescence intensity (RMFI) was carried out from 3 to 4 independent experiments as in (Shanbhag et al., 2010). Error bars represent S.D. n = 179, 204, 280, 235, 263, 215, 148, 133 and 185 for siCTRL -, siCTRL +, siFBXL10, siRNF68, siRNF2, PARPi (Olaparib), siPARP1, siTIMELESS and ATMi (KU60018) respectively. Scale bar represents 5 μm. A white dash line denotes the border of each nucleus. P values were calculated using one-way ANOVA. ****p≤0.0001, ***p≤0.001, **p≤0.01, *p≤0.05, ns = not significant. (C) Schematics of 5-EU and RNAPII Ser2 staining to monitor transcription following laser micro-irradiation in U-2OS cells. Upon transcriptional silencing due to DNA damage, one can observe a dark anti-stripe for the 5-EU and RNAPII Ser2 staining (green) on the laser track which is highlighted by the γH2A.X staining. (D) U-2OS cells transfected with the indicated siRNAs were laser micro-irradiated and treated with 5-Ethynyl Uridine (5-EU) for 1 hr prior to fixation. Cells were stained with an antibody to γH2A.X (orange). 5-EU was detected using Click -IT imaging kit (green). Scale bar represents 5 μm. The dot plot represents the relative mean intensity of the 5-EU signal along the laser stripe compared to unaffected regions of the nucleus with error bars representing S.D. At least 20 cells were analyzed per condition from 2 or three independent experiments. A white dash line denotes the border of each nucleus. P values were calculated using one-way ANOVA. ****p≤0.0001, ***p≤0.001, **p≤0.01, *p≤0.05, ns = not significant. (E) U-2OS cells were fixed 20 min after laser micro-irridiation and stained with an antibody to γH2A.X (orange) and RNAPII Ser2 (green). Scale bar represents 5 μm. The dot plot represents the relative mean intensity of the RNAPII Ser2 signal along the laser stripe compared to unaffected regions of the nucleus with error bars representing S.D. At least 22 cells were analyzed per condition from 2 or three independent experiments. A white dash line denotes the border of each nucleus. P values were calculated using one-way ANOVA. ****p≤0.0001, ***p≤0.001, **p≤0.01, *p≤0.05, ns = not significant. As a complementary technique, we monitored nascent RNA transcript production at laser microirradiation-induced DNA damage sites using 5-ethynyl uridine (5-EU) labeling (Jao and Salic, 2008), which was evaluated as shown in Figure 4—figure supplement 1B (see also schematics of the experiment in Figure 4C). Nascent RNA transcript production at DNA damage stripes was significantly reduced in control cells (Figure 4D). By contrast, nascent RNA production was significantly less reduced at sites of DNA damage in cells in which the FRRUC was either depleted by siRNA or mislocalized by inhibiting PARP1 or by depleting either PARP1 or TIMELESS (Figure 4D). Loss of nascent RNA production after DNA damage could be due to the stalling of RNA polymerase II (RNAPII). Therefore, we monitored the presence of actively elongating RNAPII at the laser-induced damage sites using an antibody against the phosphorylated heptapeptide repeats (Ser2) of the C-terminal domain of the RNAPII’s large subunit (Hsin and Manley, 2012), as shown in the schematic (Figure 4C). As expected, phosphorylation of RNAPII on Ser2 was impaired at break sites in control cells but was significantly less impaired in cells in which FBXL10, RNF68 or RNF2 were depleted, or in which the complex was mislocalized by either inhibiting PARP or depleting PARP1 or TIMELESS (Figure 4E). Altogether, these results suggest that the FRRUC is required for transcriptional silencing after DNA damage. Because of its recruitment to DNA lesions, we hypothesized that the FRRUC might regulate the response to DNA damage. Therefore, we individually downregulated FBXL10, RNF68, and RNF2 in U-2OS cells and assessed their role in the recruitment of several DNA repair proteins, using RNF8 downregulation as a positive control (see Discussion) and NCS or camptothecin (CPT, a DNA topoisomerase one inhibitor) as DNA damaging agents (Figure 5A–B). The percentages of cells containing DNA-damage induced foci were evaluated as previously described (Bunting et al., 2010; Escribano-Díaz et al., 2013; Orthwein et al., 2015). Figure 5—figure supplement 1A–B shows representative examples of foci positive and foci negative cells. The silencing of FBXL10, RNF68, or RNF2 resulted in a significant reduction in the number of cells having DNA damage-induced foci containing the RAD51 recombinase (Figure 5A–B and Figure 5—figure supplement 1A–B). At the same time, depletion of the FRRUC did not affect overall RAD51 protein levels as assessed by immunoblotting in both MIA-PaCa-2 and U-2OS cells (Figure 5D and Figure 5—figure supplement 2A), indicating that the complex acts by reducing the recruitment of RAD51 to chromatin rather than altering RAD51 levels. In addition, fewer cells contained BRCA1 foci after knockdown of FBXL10 or RNF68, and to a lesser extent after depletion of RNF2 (Figure 5A–B and Figure 5—figure supplement 1A–B). Silencing FBXL10, RNF68, or RNF2 also resulted in a significant reduction in the number of cells containing foci marked with phosphorylated RPA2 (pRPA2-S33), a signal associated with stretches of ssDNA (Vassin et al., 2009) (Figure 5A–B and Figure 5—figure supplement 1A–B). This result was confirmed using immunoblotting, which showed that phosphorylation of RPA2 on Ser4, Ser8, and Ser33 was reduced (Figure 5D and Figure 5—figure supplement 2A). Similarly, levels of phosphorylated CHK1 (Ser317) (which indicates CHK1 activation upon genotoxic stress) were lower after depletion of the FRRUC. In contrast, the levels of γH2A.X were similar in silenced cells (Figure 5D and Figure 5—figure supplement 2A), indicating that the amount of DNA damage induction was similar in all conditions. Next, using the FK2 antibody, we investigated the formation of DNA damage-induced foci containing poly-ubiquitin chains (mostly RNF8- and RNF168-dependent ubiquitylation; see Discussion), which are built in response to genotoxic stress and are critical for the DDR (Doil et al., 2009; Fujimuro et al., 1994; Huen et al., 2007; Mailand et al., 2007; Morris and Solomon, 2004; Polanowska et al., 2006; Sobhian et al., 2007). 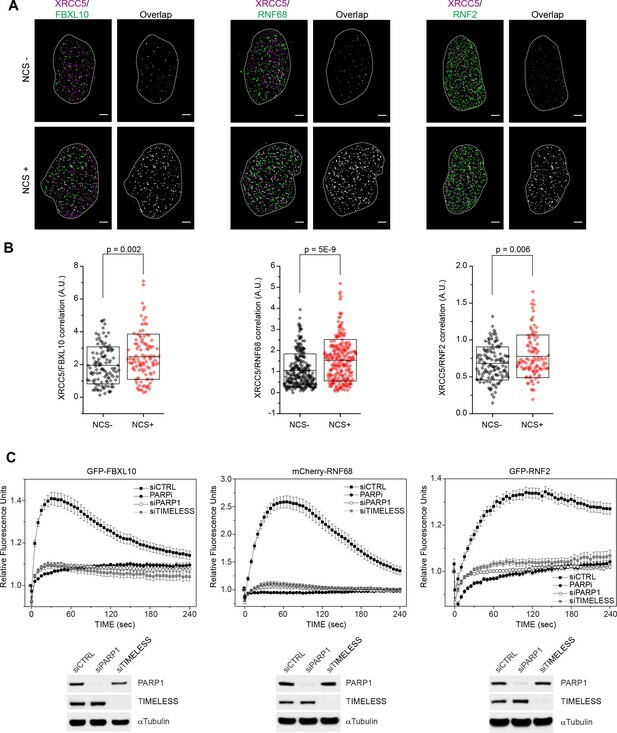 We observed that the depletion of the FRRUC resulted in a significant reduction in the number of cells displaying ubiquitin-positive foci (Figure 5A–B and Figure 5—figure supplement 1A–B). The percentage of cells containing γH2A.X or MDC1 foci (MDC1 recruitment is one of the most upstream events in the DDR) did not change by depleting either FBXL10, RNF68, or RNF2 (Figure 5—figure supplement 1A–B and Figure 5—figure supplement 2B–C). The FRUCC promotes the DNA damage response and Homologous Recombination Repair. (A) U-2OS cells were transfected with siRNA oligos targeting FBXL10, RNF68, RNF2, RNF8 or a non-targeting control (siCTRL). Cells were treated for 3 hr (BRCA1, Rad51) or 1 hr (FK2, pRPA S33) with 0.1 μg/mL neocarzinostatin (NCS. Cells were fixed and stained with the indicated antibodies. The percentages of cells containing DNA-damage induced foci (≥15 foci/nucleus) marked with the specific antibody are shown. At least 800 cells were counted for each condition from ≥3 independent experimental repetitions. Error bars represent S.E.M. Differences relative to siCTRL (NCS) were calculated using one-way ANOVA. ***p≤0.001, **p≤0.01, *p≤0.05, ns = not significant. (B) The experiment was performed in (A), except that cells were treated with 1 μM C for 6 hr (BRCA1, Rad51) or 3 hr (FK2, pRPA S33). Error bars represent S.E.M. Differences relative to siCTRL (CPT) were calculated using one-way ANOVA. ***p≤0.001, **p≤0.01, *p≤0.05, ns = not significant. (C) U-2OS cells engineered to express FLAG-HA-tagged RNF68, RNF68(ΔRING) or RNF68(Y252D) were transfected with siRNAs targeting the 3’ UTR of RNF68 (siRNF68 seq2). Cells were treated with CPT for 6 hr (BRCA1, Rad51) or 3 hr (FK2, pRPA S33) and the percentages of cells containing damage-induced foci in the specified conditions were quantified. Error bars represent S.E.M from three independent experiments. P values were calculated using one-way ANOVA. ***p≤0.001, **p≤0.01, *p≤0.05, ns = not significant. (D) MIA-PaCa-2 cells were transfected with siRNAs targeting FBXL10, RNF68, or RNF2, or a non-targeting control (siCTRL). Cells were treated with 0.1 μg/mL NCS for 30 min or 1 μM CPT for 3 hr. Cells were lysed and immunoblotting was performed as indicated. Similar results were obtained in U-2OS cells (Figure 5—figure supplement 2A). (E) Upper: schematic representation of the DR-GFP-based reporter HR assay. The reporter consists of two inactive GFP genes in tandem. SceI-GFP contains a stop codon in the I-SceI endonuclease site, and iGFP is an N-terminally truncated GFP fragment. Cleavage of Sce-GFP using expression of I-SceI endonuclease introduces a double stranded break which can be repaired by HR using the downstream iGFP sequence as a template, restoring GFP expression. Lower: graph representing the quantification of HRR measured as fold change in frequency of repair of DR-GFP U-2OS cells. DR-GFP U-2OS cells were transfected with the indicated siRNAs. GFP-positive cells were measured using flow cytometry. Bars represent the mean of ≥4 independent experiments ± S.E.M. P values were calculated using one-way ANOVA. ***p≤0.001, **p≤0.01, *p≤0.05, ns = not significant. (F) DR-GFP U-2OS were engineered to express FLAG-HA-tagged RNF68, RNF68(ΔRING) or RNF68(Y252D). Cells were transfected with siRNAs targeting the 3’ UTR (siRNF68 seq2) of RNF68 and HR repair was measured as in (E). Bars represent the mean of five independent experiments ± S.E.M. P values were calculated using one-way ANOVA. ***p≤0.001, **p≤0.01, *p≤0.05, ns = not significant. These results suggest that, in response to DNA damage, the FRRUC acts in parallel with MDC1 and upstream of the formation of foci containing poly-ubiquitin chains. Furthermore, the presence of γH2A.X and MDC1 foci in all siRNA conditions indicate that the extent of DNA damage induction was similar in all conditions. 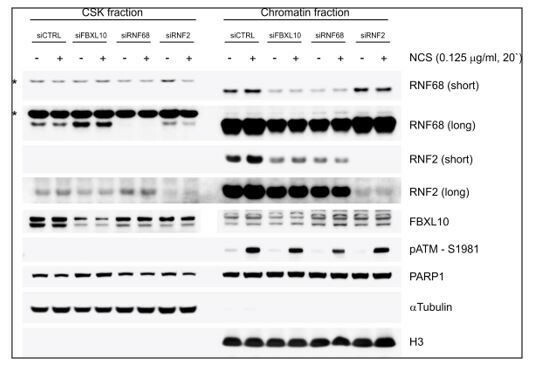 Finally, we observed that RNF68 or RNF2 depletion did not influence the percentage of cells containing 53BP1, a key protein in NHEJ (Figure 5—figure supplement 1A–B and Figure 5—figure supplement 2B–C). Thus, the FRRUC seems to affect HRR, but not the NHEJ pathway. However, fewer cells contained 53BP1 foci after FBXL10 depletion, suggesting that FBXL10 may have also a role in NHEJ independently of its interaction with RNF68 and RNF2, in agreement with the participation of FBXL10 (including FBXL10’s isoforms not included in the FRRUC) in different protein complexes (Sánchez et al., 2007). The stable expression of an siRNA-resistant wild type RNF68 construct in RNF68 depleted cells was able to significantly rescue the number of RAD51, BRCA1, pRPA32-S33, and FK2 foci (Figure 5C). In contrast, neither the siRNA-resistant RNF68(ΔRING) nor the siRNA-resistant RNF68(Y252D) could rescue the defects in the DDR due to RNF68 depletion (Figure 5C). These results demonstrate that the interaction of RNF68 with both FBXL10 and RNF2, which is necessary to form an active FRRUC, is also necessary for the assembly of DNA repair foci. Collectively, our results demonstrate that disruption of the FRRUC negatively affects the recruitment of HRR factors to sites of DNA damage and the downstream DDR. To further assess whether this complex is required for HRR, we used the DR-GFP U-2OS reporter cells, which contain a GFP-based reporter having a recognition site for the rare-cutting endonuclease I-SceI (Pierce et al., 1999) (Figure 5E). As controls, we used BRCA1 siRNA (which is known to decrease HRR) and 53BP1 siRNA (which has been shown to promote HRR) (Sy et al., 2009; Tang et al., 2013). DR-GFP cells depleted of FBXL10, RNF68, or RNF2 exhibited significantly diminished abilities to perform HRR (Figure 5E). Moreover, the mislocalization of the complex by silencing of PARP1 or TIMELESS also resulted in reduced HRR capacity (Figure 5E), in agreement with previous reports (Xie et al., 2015; Young et al., 2015). Again, we were able to significantly rescue the effect of RNF68 depletion by stably expressing an siRNA-resistant RNF68 construct, and this rescue depended on RNF68’s RING domain and ability to bind FBXL10 (Figure 5F). Importantly, depletion of FBXL10, RNF68, RNF2, PARP1 or TIMELESS did not have any appreciable impact on cell cycle distribution, as shown by BrdU-PI staining (Figure 5—figure supplement 2D), ensuring that the effects on the HHR pathway are not secondary to cell cycle differences. 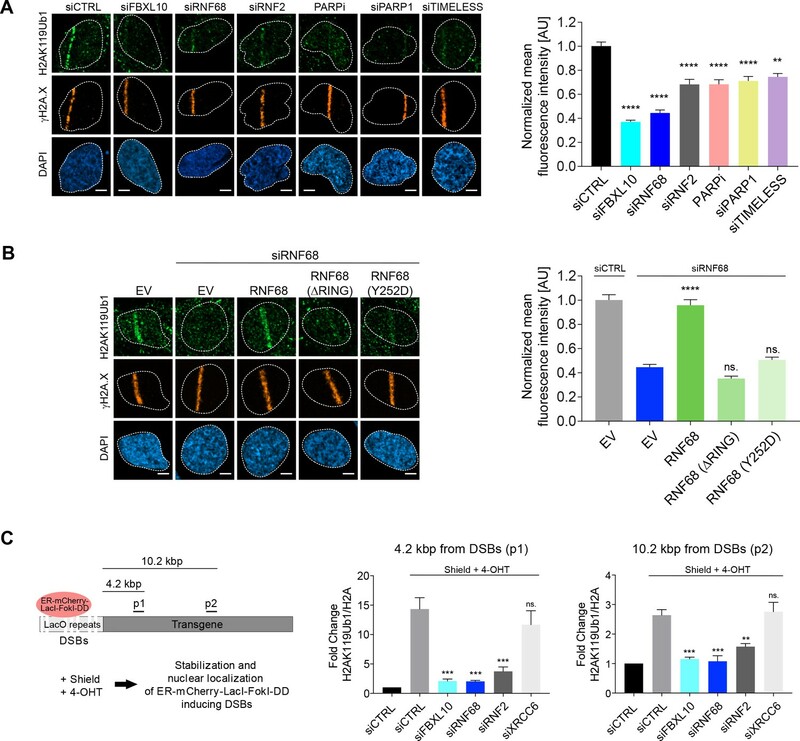 No significant reduction in DNA repair mediated by NHEJ was observed upon depletion of RNF68 or RNF2, as assessed by employing a cNHEJ assay based on the EJ5-GFP reporter U-2OS cell line (Bennardo et al., 2008) (Figure 5—figure supplement 2E). Depletion of FBXL10 resulted in a reduction in NHEJ (Figure 5—figure supplement 2E), in agreement with the reduction in 53BP1 foci (Figure 5—figure supplement 1A–B and Figure 5—figure supplement 2B–C), again, suggesting that FBXL10 may play a role in NHEJ independently of RNF68 and RNF2. Finally, the reduction in the DDR and HRR in cells depleted of FBXL10, RNF68, or RNF2, correlated with an increased sensitivity to DNA damage as shown by the survival curves of cells treated with increasing concentrations of NCS (Figure 5—figure supplement 2F). Such hypersensitivity is suggestive of defective DNA repair. We observed that, despite the relative increase in H2AK119Ub1 levels (Figure 3A–C), H2A levels were significantly reduced at the FokI nuclease-induced DNA damage sites (Figure 6—figure supplement 1A), in agreement with previous reports (Batenburg et al., 2017; Berkovich et al., 2007; Strickfaden et al., 2016). Importantly, this reduction was inhibited by the depletion of FBXL10, RNF68, or RNF2, suggesting that the FRRUC is involved in the eviction of H2A near DNA damage sites (Figure 6—figure supplement 1A). H2A.Z has been shown to be rapidly incorporated into sites of DNA damage and has been implicated in making the chromatin less compact to facilitate DNA repair (Alatwi and Downs, 2015; Gursoy-Yuzugullu et al., 2015; Xu et al., 2012). To test whether the reduction in H2A is accompanied by a corresponding increase in the variant H2A.Z histone, we monitored the recruitment of H2A.Z to FokI-induced DSBs by qChIP 1 hr after induction, finding that the ratio of H2A.Z over H2A was increased ~4.2 and ~10.2 kbp from the DSB (Figure 6A). This increase was abolished after depletion of FBXL10, RNF68, or RNF2, demonstrating that the FRRUC is necessary for the enrichment of H2A.Z into sites of DNA damage (Figure 6A). Four hours after induction of FokI, the relative enrichment of H2A.Z over H2A was still detectable, although to a lesser extent (Figure 6B), in agreement with previous reports of transient incorporation of H2A.Z at DNA lesions (Gursoy-Yuzugullu et al., 2015; Kalocsay et al., 2009; Xu et al., 2012). The recruitment of H2A.Z to DSBs depends on the FRUCC. (A) qChIP was performed in the DSB reporter U-2OS cells (see Figure 3C) with and without FokI-induced DSBs using the indicated antibodies. The results are shown as a ratio of H2A.Z to H2A levels. The mCherry-LacI-FokI-DD nuclease was induced for 1 hr using Shield-1 and 4-OHT. qPCR-results for amplicons 4.2 kbp (p1) and 10.2 kbp (p2) from the induced DSBs are shown. Error bars represent S.E.M from four independent experiments. P values were calculated using one-way ANOVA. ***p≤0.001, **p≤0.01, *p≤0.05, ns = not significant. (B) The qChIPs were performed as in (A) except that the mCherry-LacI-FokI-DD nuclease was induced for 4 hr using Shield-1 and 4-OHT. (C) SR imaging was performed to analyze the colocalization between XRCC6 and H2A.Z, before and after 1 hr of CPT treatment. U-2OS cells were serum starved for 72 hr, followed by release for 14 hr into complete media. Cells were fixed and stained with antibodies to XRCC6 (magenta) and H2A.Z (green). Representative nuclei are shown the left. A white dash line denotes the border of each nucleus. Scale bar represents 3 μm. The signal overlap (white) demonstrates the colocalization between XRCC6 and H2A.Z. The graph on the right displays the correlation between XRCC6 and H2A.Z in individual nuclei. Untreated, n = 87; CPT, n = 102. The number of analyzed nuclei, n, is pooled from the three independent experiments. A.U., arbitrary units. Whisker box shows mean and S.D. values. P values were calculated using two-sample t-test between CPT - and CPT + samples. (D) U-2OS cells were transfected with siRNAs targeting FBXL10, RNF68, or RNF2 and subjected to NCS treatment for 20 min followed by fixation and immunostaining with antibodies to γH2A.X (magenta) and H2A.Z (green). SR imaging was performed to analyze the colocalization between γH2A.X and H2A.Z. Representative nuclei are shown in the top panels, and signal overlap is shown in the lower panels. Scale bar represents 5 μm. The graph on the right represents the correlation between γH2A.X and H2A.Z after depletion of the indicated proteins. Amplitudes were normalized to the mean value of siCTRL. Error bars represent S.E.M. n = 546, 160, 172, 167, 237, 159 and 151 nuclei for siCTRL, siFBXL10, siRNF68, siRNF2, PARPi (Olaparib), siPARP1 and siTIMELESS respectively. The n value is pooled from the three independent experiments. Errors bars show S.E.M. P values were calculated using two-sample t-test between siCTRL and each indicated siRNA. ***p≤0.001, **p≤0.01, *p≤0.05, ns = not significant. (E) U-2OS cells stably expressing FLAG-HA-tagged RNF68, RNF68(ΔRING), RNF68(Y252D) or infected with an empty vector (EV) were transfected with siRNAs targeting the 3’ UTR of RNF68 (siRNF68 seq2) or a non-targeting control (siCTRL). Cells were subjected to NCS treatment for 20 min and the extent of colocalization between γH2A.X and H2A.Z was analyzed by dSTORM microscopy, as in (D). Scale bar represents 5 μm. Correlation amplitudes were normalized to the mean value of siCTRL EV. Errors represent S.E.M. n = 363, 224, 296, 206, and 253 nuclei for siCTRL EV, siRNF68 EV, RNF68(WT), RNF68(ΔRING), and RNF68(Y252D), respectively. The n value is pooled from three independent experiments. Differences relative to siRNA68 EV were calculated using two-sample t-test. ***p≤0.001, **p≤0.01, *p≤0.05, ns = not significant. (F) DSB reporter U-2OS cells were transiently transfected with FLAG-Strep-tagged H2A, H2A(K119/120R) or with an empty vector (EV). qChIP was performed with and without FokI-induced DSBs using the indicated antibodies. The results are shown as a ratio of H2A.Z to H2A levels. The mCherry-LacI-FokI-DD nuclease was induced for 1 hr using Shield-1 and 4-OHT. qPCR-results for amplicons 4.2 kbp (p1) and 10.2 kbp (p2) from the induced DSBs are shown. Error bars represent S.E.M from five independent experiments. P values were calculated using one-way ANOVA. ***p≤0.001, **p≤0.01, *p≤0.05, ns = not significant. In contrast to the changes observed with H2A and H2A.Z, we detected no changes in γH2A.X accumulation at FokI-induced DSBs upon depletion of the FRRUC (at both ~4.2 and ~10.2 kbp from the break sites) (Figure 6—figure supplement 1B), suggesting that the amount of DNA damage induction was similar in all conditions. Importantly, in undamaged cells, the H2A.Z/H2A ratios were similar among control cells and cells depleted of either FBXL10, RNF68, or RNF2, indicating that there was no impairment in H2A.Z deposition before DNA damage induction (Figure 6—figure supplement 1C). We have also evaluated the enrichment of macroH2A.1, another histone H2A variant, at DSBs. We found a slight increase in macroH2A.1 levels at DSBs, but this increase was not significant (Figure 6—figure supplement 1D). We wished to use a complementary technique to validate that the increase in H2A.Z levels at sites of DSBs was dependent on the FRRUC. Once again, we utilized dSTORM as an approach to precisely detect localization patterns within the nucleus. First, we confirmed that H2A.Z was enriched at DNA damage sites (Figure 6C), similarly to FBXL10, RNF68, and RNF2 (Figure 1A–B). Importantly, analysis of H2A.Z and γH2A.X in cells treated with NCS showed that the magnitude of their correlation diminished upon depletion of FBXL10, RNF68, or RNF2 (Figure 6D and Figure 6—figure supplement 1E), a further indication that the FRRUC is required for H2A.Z localization to sites of DNA damage. Accordingly, mislocalization of the FRRUC (through inhibition of PARP or depletion of PARP1 or TIMELESS) also resulted in the failure to properly localize H2A.Z at sites of DNA damage (Figure 6D and Figure 6—figure supplement 1E). To control for possible off-target effects of the siRNA, we stably expressed an siRNA-insensitive RNF68 construct and found that it was able to rescue the effect of RNF68 depletion (Figure 6E and Figure 6—figure supplement 1F). In contrast, stable expression of either an siRNA resistant RNF68(Y252D) or an siRNA resistant RNF68(ΔRING) was unable to complement the defect in H2A.Z recruitment seen in RNF68-depleted cells (Figure 6E and Figure 6—figure supplement 1F), suggesting that the ability to bind both FBXL10 and RNF2 to establish an active FRRUC is important in this process. Combined, these measurements establish that the FRRUC is required for proper H2A.Z recruitment to sites of DNA damage. In unperturbed human cells, the incorporation of H2A.Z-H2B dimers into nucleosomes relies on the SCRAP and P400 chromatin remodeler complexes (Choi et al., 2009; Gévry et al., 2007; Ruhl et al., 2006), with the P400 complex being involved in the incorporation of H2A.Z also upon DSBs (Xu et al., 2012). We investigated whether the shared subunits of these complexes, the AAA+ helicases, TIP48 (also named RVB2) and TIP49 (also named RVB1) recruit to DNA lesions. We used laser micro-irradiation to induce local DNA damage in human U-2OS cells, which was visualized by γH2A.X staining, and detected an accumulation of TIP48 and TIP49 on the γH2A.X tracks. We found that depletion of FBXL10, RNF68, or RNF2 did not affect the recruitment of TIP48 and TIP49 (Figure 6—figure supplement 1G–H). To gain mechanistic insights on how the FRRUC and H2AK119Ub1 promote the recruitment of H2A.Z at DNA damage sites, we used a strategy previously used by the Greenberg’s group (Shanbhag et al., 2010). Specifically, we overexpressed either wild-type H2A or H2A(K119/120R), a H2A mutant in which Lys119 and Lys120 were changed to arginines, in the inducible FokI reporter cell line. These two constructs were equally incorporated in the chromatin, as detected by ChIP, and did not affect the amount of damage to the DNA, as detected by the levels of γH2A.X at the sites of damage (Figure 6—figure supplement 1I). We observed a reduction in H2A.Z loading at DSBs in cells overexpressing H2A(K119/120R) compared to control cells and cells overexpressing wild-type H2A (Figure 6F). This result is in agreement with the fact that only wild-type RNF68, but not the two inactive RNF68 mutants, rescued the defect of H2A.Z loading (Figure 6E), and indicates that the FRRUC-dependent mono-ubiquitylation of H2A is required for proper H2A.Z loading. Upon genotoxic stress, the FRRUC induces H2A mono-ubiquitylation and represses transcription at damage sites (Figure 3 and Figure 4) and, at the same time, promotes H2A.Z incorporation (Figure 6). Therefore, we wished to investigate if H2A.Z is also required for DSB mediated transcriptional silencing. While H2A mono-ubiquitylation was not impaired upon H2A.Z silencing (Figure 7A), we detected significantly more nascent RNA transcript production near DSB sites in H2A.Z depleted cells compared control cells (Figure 7B). [H2A.Z silencing did not have a negative effect on FokI nuclease levels (Figure 7—figure supplement 1)]. Similarly, there was a decrease in both 5-EU incorporation and phosphorylation of RNAPII on Ser2 at laser induced damage sites in control cells, and this decrease was significantly less in cells in which H2A.Z was depleted (Figure 7C–D). Similar to the depletion of the FRRUC, H2A.Z depletion in both U-2OS and MIA-PaCa-2 cells also induced a reduction in the phosphorylation of RPA2 on Ser4, Ser8, and Ser33 as well as in the phosphorylation of CHK1 (Ser317) (Figure 7E), all events necessary for efficient HRR repair. Again, we observed no changes in γH2A.X levels upon H2A.Z silencing, showing that the amount of DNA damage induction was similar in all conditions (Figure 7E). Finally, we found that H2A.Z is required for efficient HRR (Figure 5E). H2A.Z is involved in transcriptional repression at sites of DNA breaks and is required for efficient DSB signaling. (A) U-2OS cells were transfected with H2A.Z siRNA or CTRL siRNA. Cells were fixed 30 min after laser micro-irradiation and stained with antibodies to γH2A.X (orange) and H2AK119Ub1 (green). Scale bar represents 5 μm. The graph represents the mean intensity of the H2AK119Ub1 signal on the γH2A.X track, normalized to the mean values of the siCTRL sample. At least 40 laser stripes were analyzed per condition from 2 or three independent experiments. Error bars represent S.E.M. Differences relative to siCTRL were calculated using the nonparametric Mann-Whitney test. (B) Transcription activity was measured in cells silenced against H2A.Z upon induction of DSBs in U-2OS FokI-YFP-MS2 reporter cells. Quantification of YFP-MS2 relative mean fluorescence intensity (RMFI) was carried out from three independent experiments. Error bars represent S.D. n = 115, 103, 175 and 103 for siCTRL -, siCTRL +, siH2AZ and ATMi (KU60018) respectively. A white dash line denotes the border of each nucleus. Scale bar represents 5 μm. P values were calculated using one-way ANOVA. ****p≤0.0001, ***p≤0.001, **p≤0.01, *p≤0.05, ns = not significant. (C) Cells were transfected with H2A.Z siRNA or CTRL siRNA. Cells were treated with 5-Ethynyl Uridine (5-EU) immediately after laser microirradiation and were fixed 1 hr after damage induction. 5-EU was detected using Click -IT imaging kit (green) and stained with antibody to γH2A.X (orange). Scale bar represents 5 μm. The dot plot represents the relative mean intensity of the EU signal located along the laser stripe compared to unaffected regions of the nucleus with error bars representing S.D. At least 25 cells were analyzed per condition from 2 or three independent experiments. P values were calculated using the nonparametric Mann-Whitney test. (D) Right panel: Cells were stained with antibodies to γH2A.X (orange) and RNAPII Ser2 (right panel) 20 min after laser microirradiation. Scale bar represents 5 μm. The dot plot represents the relative mean intensity of the RNAPII Ser2 signal along the laser stripe compared to unaffected regions of the nucleus with error bars representing S.D. At least 25 cells were analyzed per condition from 2 or three independent experiments. P values were calculated using the nonparametric Mann-Whitney test. (E) U-2OS and MIA-PaCa-2 cells were transfected with siRNA targeting H2A.Z or a non-targeting control (siCTRL). Cells were treated with 0.1 μg/mL NCS for 30 min or 1 μM CPT for 3 hr. Cells were lysed and immunoblotting was performed as indicated. (F) Model of the role of the FRUCC in the response to genotoxic stress. See text for details. Altogether, these results indicate that H2A.Z incorporation, which is downstream to the FRRUC and H2AK119Ub1, contributes to transcriptional silencing after DNA damage, as well as efficient DNA damage signaling and HRR. Epigenetic modifications and chromatin remodeling are key for modulating, propagating, and fine-tuning the DDR and associated signaling cascades necessary for DNA repair. We show here that the FRRUC is recruited to sites of DNA damage in a PARP1- and TIMELESS-dependent manner. Our results demonstrate that the complex is required for efficient mono-ubiquitylation of histone H2A on K119, a decrease of H2A levels at DSBs, localization of the histone variant H2A.Z to sites of DNA damage, transcriptional repression, DSB signaling, and proper HRR (see model in Figure 7F). In response to genotoxic stress, transcriptional silencing is thought to facilitate DNA damage resolution by ensuring that the transcriptional machinery does not interfere sterically with DNA damage repair factors (e.g. by avoiding the collision of the elongating RNA Polymerase complex with DNA repair complexes) (Uckelmann and Sixma, 2017). Several factors and complexes, such as NurRD, PBAF, ENL, RNF8, NELF-E, and RNF51-UBR5 have been implicated in the DNA damage-induced transcriptional repression (Awwad et al., 2017; Chou et al., 2010; Gong et al., 2017; Kakarougkas et al., 2014; Paul and Wang, 2017; Sanchez et al., 2016, 2010; Ui et al., 2015). One of the key determinants of transcriptional repression at sites of DNA damage is the mono-ubiquitylation of H2A on K119 (Kakarougkas et al., 2014; Shanbhag et al., 2010; Ui et al., 2015). We found that the mono-ubiquitylation of histone H2A on K119 is largely impaired by the depletion of the FRRUC. Similarly, the FRRUC is a major contributor to the mono-ubiquitylation of histone H2A on K119 in transcriptional regulation (Blackledge et al., 2014; Rose et al., 2016; Taherbhoy et al., 2015). It has been shown that RNF51-RNF2 and RNF110-RNF2 are recruited to chromatin after DNA damage to contribute to the mono-ubiquitylation of H2A on K119 (Bergink et al., 2006; Ginjala et al., 2011; Gracheva et al., 2016; Ismail et al., 2010; Pan et al., 2011; Sanchez et al., 2016). Our results show that the FRRUC is necessary for the proper recruitment of these two cPRC1s in response to genotoxic stress. Moreover, our findings suggest that the FRRUC is the most upstream ubiquitin ligase in charge of mono-ubiquitylating histone H2A on K119 and that, subsequently, cPRC1s maintain this modification. Interestingly, a recent study measured the kinetics of recruitment of 70 DNA repair proteins to laser-induced DNA damage sites in HeLa cells (Aleksandrov et al., 2018). Compared to the recruitment of these 70 proteins, FBXL10, RNF68, and RNF2 display a very fast recruitment, suggesting that this represent one of the most upstream events in response to genotoxic stress. The DNA damage response frequently re-purposes the function of specific transcriptional regulators to enact DNA repair (Sarcinella et al., 2007; Shiloh and Ziv, 2013). Our results reveal that the presence, localization, and activity of the FRRUC, in addition to mono-ubiquitylate H2A on K119 (as in unstressed cells), is also required for an efficient H2A/H2A.Z exchange at DNA lesions. Notably, whereas H2A.Z is not required for H2A mono-ubiquitylation, the FRRUC-dependent mono-ubiquitylation of H2A is required for proper H2A.Z loading. This event, in turn, contributes to transcriptional repression, the DDR, and HRR. H2A.Z has been shown to function in the early stages of DNA repair (Adkins et al., 2013; Alatwi and Downs, 2015; Gursoy-Yuzugullu et al., 2015; Jiang et al., 2015; Kalocsay et al., 2009; Xu et al., 2012). H2A.Z is rapidly, yet transiently, recruited to DSBs (Alatwi and Downs, 2015; Gursoy-Yuzugullu et al., 2015; Kalocsay et al., 2009; Kusch et al., 2004; Nishibuchi et al., 2014; Xu et al., 2012). H2A.Z shares 56% sequence identity with H2A and the differences account for a structurally less stable interface between H2A.Z and the H3-H4 subunits of the nucleosome. In fact, H2A.Z appears to make weakened, loose nucleosomes that are easy to bend and disassemble, leading to a more accessible chromatin (Bönisch et al., 2012; Jin and Felsenfeld, 2007; Jin et al., 2009; Suto et al., 2000; Xu et al., 2012), which may favor recruitment of DNA repair factors. H2A.Z has been associated with both positive and negative transcriptional regulation depending on its post-translational modifications (Guillemette and Gaudreau, 2006; Hu et al., 2013). Mono-ubiquitylation of H2A.Z on K120 and K121 is correlated with transcriptional silencing (Draker et al., 2011; Sarcinella et al., 2007), whereas H2A.Z acetylation on its N-terminus is associated with transcriptional activity (Valdés-Mora et al., 2012). Interestingly, mono-ubiquitylation of H2A.Z has been attributed to RNF2 activity (Sarcinella et al., 2007). Thus, the FRRUC could be involved in transcriptional silencing by several non-exclusive – and, perhaps, linked – means: (i) mono-ubiquitylating H2A, (ii) facilitating exchange of a subpopulation of H2A with H2A.Z, and (iii), mono-ubiquitylating H2A.Z. It is possible that, upon DNA damage, H2A.Z can simultaneously ‘loosen’ the chromatin to facilitate the access to DNA repair factors (this is the reason for which a subpopulation of H2A is exchanged for H2A.Z) and mediate transcriptional silencing (conceivably, by its mono-ubiquitylation). How mono-ubiquitylation of histones mechanistically controls at the molecular level downstream effects (such as nucleosome rearrangements, chromatin remodeling, transcriptional repression, etc.) remains an unsolved question in both the field of DNA damage and the field of transcription (Hauer and Gasser, 2017; Nair et al., 2017). Future investigations will be necessary to answer these fundamental questions, in general, and, more specifically, how the mono-ubiquitylation of H2A regulates its exchange with H2A.Z. Our results indicate that the PARP1- and TIMELESS-dependent recruitment of the FRRUC to sites of DNA damage plays an early and critical regulatory role in homologous recombination repair by promoting local transcriptional inhibition both via the mono-ubiquitylation of H2A and the establishment of a chromatin structure containing H2A.Z. Accordingly, PARP1 has been implicated in H2A displacement and chromatin decondensation after DNA damage (Sellou et al., 2016; Strickfaden et al., 2016). The regulation of FBXL10, RNF68, and RNF2 by TIMELESS is unusual since the recruitment of other factors downstream of PARP, such as XRCC1 and Ligase 3 (that are required for single strand break and base excision repair), is affected by PARP1 silencing (Campalans et al., 2013; Godon et al., 2008; Mortusewicz et al., 2006; Okano et al., 2003), but not by TIMELESS depletion, suggesting a specific role of TIMELESS in controlling DSB repair. In response to DNA damage, in addition to the mono-ubiquitylation of K119/K120, H2A and H2A.X are also ubiquitylated on both K13 and K15. This event requires two steps: first, an RNF ubiquitin ligase, namely RNF8, decorates H1 type linker histones and L3MBTL2 with K63-linked ubiquitin chains (Mandemaker et al., 2017; Nowsheen et al., 2018). Next, these chains are recognized by RNF168, another RNF ubiquitin ligase, that mono-ubiquitylates H2A and H2A.X on K13 and K15 (Gatti et al., 2012; Leung et al., 2014; Mattiroli et al., 2012; Thorslund et al., 2015). Ultimately, a K63 chain (and, possibly other kind of ubiquitin chains) is/are built on mono-ubiquitylated H2A and H2A.X, although the ubiquitin ligase involved in this elongation step is still debated (Uckelmann and Sixma, 2017). These ubiquitin chains are crucial for the recruitment of DNA repair factors, an event necessary for both efficient HRR and NHEJ (Schwertman et al., 2016). Notably, neither RNF8 nor RNF168 can ubiquitylate K119 and K120 of H2A/H2A.X, and, vice versa, RNF2 and its interacting PCGFs are unable to ubiquitylate K13 and K15 (Mattiroli et al., 2012; Wang et al., 2004). Our findings show that, similar to the ubiquitylation of K13 and K15, the ubiquitylation of K119 and K120 in H2A/H2A.X is also involved in the recruitment of DNA repair factors. Intriguingly, while the FRRUC is necessary for an efficient DDR, ATM inhibition increases the recruitment of the FRRUC. ATM might limit the spread of the FRRUC and the subsequent H2A mono-ubiquitylation to maintain the signal at DSB proximities. In conclusion, we show that the PARP1-TIMELESS-FRRUC axis is required for the localization of H2A.Z to sites of DNA damage. This ensures the proper transcriptional silencing and chromatin composition necessary for the efficient activation of DDR and HRR. Laser-induced DNA damage induction and live-cell imaging were essentially performed as in (Young et al., 2015). Briefly, ~50,000 cells were plated per well of a four-well Lab-Tek II chambered number 1.5 borosilicate coverglass for 24 hr before imaging. RNAi silencing transfections were performed approximately 2 days prior to microscopy using two rounds of silencing. Cells were pre-sensitized with 10 μM BrdU (Merck) for 36 hr. For imaging, on the day of data collection, cells were incubated in FluoroBriteTM DMEM supplemented with 10% FBS, 25 mM HEPES, and sodium pyruvate. Imaging was performed using a DeltaVision Elite inverted microscope system (Applied Precision), using a 60 × oil objective (numerical aperture 1.42) from Olympus. Excitation was achieved with a 7 Color Combined Insight solid state illumination system equipped with a polychroic beam splitter with filter sets to support GFP (ex. : 475/28 nm, em. : 525/50 nm) and mCherry (ex. : 575/25 nm, em. : 632/60 nm). Images were acquired using a CoolSNAP HQ2 camera. DNA damage was generated using a 405 nm, 50 mW laser at 100% power for 0.5 s. Two pre-laser images were recorded, and the number and interval of post-laser images varied in each experiment (as indicated on the kinetic plots). Recruitment intensity was analyzed using a macro written for ImageJ (RRID:SCR_003070) that calculated the ratio of intensity of a defined laser spot A to the adjacent area B after subtraction of the background intensity of an unpopulated area of the image C (Young et al., 2015). Thus, the relative fluorescent unit (RFU) for each data collection point was calculated by the equation RFU = (A − C)/(B − C). In instances where fluorescent recruitment was not detected, the coordinates of A were determined by use of laser coordinates recorded in the data log file. The mean values and standard errors from several cells and live-cell imaging time courses were computed for each time point using Origin (2016) software. To visualize the recruitment of endogenous FBXL10, RNF68 and RNF2, laser induced laser stripes were done on a Zeiss LSM 800 microscope (RRID:SCR_015963), using a 405 nm diode laser (5 mW) with the timed bleach option (60 iterations, 80% laser power output) in the ZenBlue 2.1 software using a Plan-Apochromat 63x/1.40 Oil objective after pre-sensitizing the cells with 1 μg/ml Hoechst 33342 for 30 min. FBXL10, RNF68, RNF2, and FBXL11 cDNAs were inserted into several different vector backbones, including modified pcDNA3.1 vectors containing N-terminal FLAG/HA/myc-tags, pBABE.puro retroviral vectors containing N-terminal FLAG/HA/myc/GFP-tags; and pRetroQ-mCherry-C1 retroviral vector containing an mCherry-tag. Site-directed mutagenesis was performed using KAPA polymerase (KAPA Biosystems). Specific details will be provided on request. The following antibodies were used: BRCA1 (1:200 (IF), 1:1000 (WB), Bethyl cat. No. A301-377A, RRID:AB_937735), BrdU (1:100, DAKO cat. No. M0744, RRID:AB_10013660), pCHK1 (S317) (1:1000, Cell Signaling cat. No. 2344S, RRID:AB_331488), CHK1 (1:1000, Santa Cruz Biotechnology cat. No. sc-8408, RRID:AB_627257), c-myc (1:2000, Bethyl cat. No. A190-105A, RRID:AB_67390), FLAG (1:2000, Sigma-Aldrich cat No. F1804, RRID:AB_262044), FK2 (1:1000, Merck cat. No. 04–263, RRID:AB_612093), GAPDH (1:5000, Sigma-Aldrich cat No. G8795, RRID:AB_1078991), HA.11 (16B12) (1:5000, Covance cat. No. MMS-101P, RRID:AB_2314672), HA (1:2000, Bethyl cat. No. A190-108A, RRID:AB_67465), MDC1 (1:2000, Bethyl cat No. A300-051A, RRID:AB_203282), Mouse Gamma Globulin Control (10 μg (ChIP), ThermoFisher Scientific cat. No. 31878, RRID:AB_2532170), Rabbit Gamma Globulin Control (10 μg (ChIP), ThermoFisher Scientific cat. No. 31887, RRID:AB_2532177), H2A (1:1500 (WB) 10 μL (ChIP), Active Motif cat. No. 39111), H2AK119Ub1 (1:1000 (WB), 1:1000 (IF), 10 μL (ChIP), EMD Millipore cat. No. 05–678, RRID:AB_309899), γH2A.X (1:1500 (WB), 1:5000 (IF), 5 μL (ChIP), EMD Millipore cat. No. 05–636, RRID:AB_309864), γH2A.X (1:1000 (IF), Cell Signaling Technology cat. No. 9718, RRID:AB_2118009), H2A.Z (1:1000 (WB), 1:2000 (IF), 5 μL (ChIP), Active Motif cat. No. 39113, RRID:AB_2615081), Histone H3 (1:30000 (WB), 3 μL (ChIP), Abcam cat. No. ab1791, RRID:AB_302613), mCherry (1:1000, LifeSpan BioSciences cat. No. LS-C204826), macroH2A.1 (2 μL (ChIP), Abcam cat No. ab37264, RRID:AB_883064), RAD51 (1:500 (IF), GeneTex cat. No. GTX70230, RRID:AB_372856), RAD51 (1:1000 (WB), Santa Cruz Biotechnology cat. No. sc-8349, RRID:AB_2253533), PARP1 (1:1000, Cell Signaling Technology cat. No. 9542S, RRID:AB_2160739), RNA Polymerase II phospho-Ser2 (1:1000 (IF), BioLegend cat. No. 920204, RRID:AB_2616695), RNF2 (1:1000 (WB and IF), Cell Signaling Technology cat. No. 5694S, RRID:AB_10705604), RNF51 (1:1000 (WB), Bethyl cat No. A301-694A, RRID:AB_1210891), RNF68 (1:1000 (WB and IF), Sigma-Aldrich cat. No. HPA011356, RRID:AB_1855063), RNF68 (1:1000 (WB) Santa Cruz Biotechnology cat. No. sc-515371, RRID:AB_2721914), RNF110 (1:1000 (WB) Millipore cat No. 09–724, RRID:AB_11212898), RPA32 (1:5000, Merck cat. No. MABE285, RRID:AB_11205561), pRPA32 (S4/S8) (1:5000 (WB), Bethyl cat No. A300-245A, RRID:AB_210547), pRPA32 (S33) (1:2000 (IF), 1:5000 (WB), Bethyl cat No. A300-246A, RRID:AB_2180847), TIMELESS (1:1000, Bethyl cat. No. A300-961A, RRID:AB_805855), TIP48 (1:100 (IF), Proteintech, cat No. 10195–1-AP, RRID:AB_2184679), TIP49 (1:500 (IF), Millipore cat No. 06–1299, RRID:AB_10806083), TP53BP1 (1:1000 (IF), Abcam cat. No. ab36823, RRID:AB_722497), αTubulin (1:5000 (WB), Sigma-Aldrich cat No. T6074, RRID:AB_477582), XRCC5 (1:1000 (IF), Abcam cat. No. ab198587), XRCC6 (1:1000 (WB), Santa Cruz Biotechnology cat. No. sc-9033, RRID:AB_650476), XRCC6 (1:2000 (IF), ThermoFisher Scientific cat. No. MA5-13110, RRID:AB_10976973). A custom affinity-purified rabbit polyclonal antibody to FBXL10 was produced by Genscript (RRID:SCR_002891) against the following peptide sequence: N-CNHAGKTGKQKRGPG-C). Antibodies to SKP1 have been described previously (Pagan et al., 2015). Cell lines were purchased from ATCC and were routinely checked for mycoplasma contamination with the Universal Mycoplasma Detection Kit (ATCC 30–1012K). HEK293T (ATCC CRL-3216, RRID:CVCL_0063) and MIA-PaCa-2 (ATCC CRL-1420, RRID:CVCL_0428) cells were maintained in Dulbecco`s modified Eagle`s medium (Gibco). U-2OS (ATCC HTB-96, RRID:CVCL_0042) cells were maintained in McCoy's 5A medium (Gibco). Media was supplemented with 10% FBS (Corning Life Sciences) and 1% penicillin/streptomycin/L-glutamine (Corning Life Sciences). All cell lines were maintained at 37°C at 5% CO2 in a humidified atmosphere. Cells were treated with 0.1 μg/ml neocarzinostatin (Sigma) or 1 μM CPT (Sigma). Cells were pretreated with inhibitors to ATM (KU60019, Tocris, 5 μM), ATR (AZ20, Tocris, 1 μM), DNA-PK (NU7441, Tocris, 5 μM), and PARP (PJ34, EMD Millipore, 300 nM or Olaparib, Selleck Chemicals, 1 μM) for 1 hr prior to laser-induced DNA damage. Both U-2OS reporter cell lines having the inducible ER-mCherry-LacI-FokI-DD nuclease used for qChIP and to measure transcription were a gift from Prof. Roger A. Greenberg (University of Pennsylvania) (Tang et al., 2013). ER-mCherry-LacI-FokI-DD was induced with Shield1 ligand (250 nM) and 4-OHT (500 nM) for the indicated amount of time. U-2OS cells were transiently transfected using Lipofectamine 3000 (ThermoFisher Scientific) based on the manufacturer’s recommendation. HEK293T cells were transiently transfected using polyethylenimine (Pagan et al., 2015; Skaar et al., 2015). For retrovirus production, HEK293T cells were transfected with pBABE.puro or pRetro-Q backbone vectors containing the genes of interest, in combination with Gag-Pol and VSV-G plasmids (Clontech) (Dankert et al., 2016). siRNA oligo transfections were performed using RNAiMax (ThermoFisher Scientific) according to the manufacturer’s instructions. The following siRNA duplexes from Dharmacon were used: D-001810–01 (non-targeting control); L-014930–00 (FBXL10 seq1); CCUUAAGGUAGGAGAGAAUdTdT (FBXL10 seq2); L-007094–00 (RNF68 seq1); CCCAGAUAUUUAUGUGAAAUU (RNF68 seq2); L-006556–00 (RNF2 seq1); UUAAAGAUGUACUGGCAUUUU (RNF2 seq2); L-005230–01 (RNF51); L-006584–00 (RNF110); L-003461–00 (BRCA1); L-003548–00 (TP53BP1); L-006900–00 (RNF8); L-005084–00 (XRCC6); L-006659–06 (PARP1); L-019488–06 (TIMELESS); L-011683–00 (H2AFZ). Cells were lysed in lysis buffer (25 mM Tris pH 8.0, 150 mM NaCl, 10% glycerol, 1 mM EDTA, 1 mM EGTA, 1 mM 1,4-Dithiothreitol (DTT) and 0.1% NP-40) supplemented with protease (Complete ULTRA, Roche) and phosphatase inhibitors (PhosSTOP, Roche). The insoluble fraction was removed by centrifugation (20,000 x g x 15 min at 4°C). Immunoprecipitations and affinity precipitations were carried out using FLAG-M2 agarose (Sigma-Aldrich) or anti-HA Affinity Matrix (Roche) at 4°C for 1 hr. Beads were washed once in lysis buffer before washing with CSK buffer (10 mM PIPES, pH 7.0, 100 mM NaCl, 300 mM sucrose, 1 mM EGTA, 3 mM MgCl2, 0.1% Triton X-100) containing 1 U/mL TurboNuclease (Accelagen) for 15 min at RT. Beads were extensively washed in lysis buffer and elution was carried out with 3 × FLAG peptide (Sigma-Aldrich) or HA peptide (Roche). Immunoblotting was performed as previously described (Pagan et al., 2015). Cells cultured on coverslips were either pre-extracted with ice-cold CSK buffer containing 0.5% Triton X-100 for 5 min, or directly fixed in 4% paraformaldehyde/PBS after a PBS wash. For endogenous FBXL10, RNF68 or RNF2 staining, samples were heated to 65°C for 10 min in an epitope unmasking buffer (10 mM Sodium citrate, 0.05% Tween 20, pH 6.0). Samples were then blocked in blocking buffer (PBS/0.05% Triton X-100 containing 5% FBS and 3% BSA) before incubation with indicated primary antibodies in blocking buffer. Alexa-555 and Alexa-488-conjugated secondary antibodies were from Life Technologies. Slides were mounted in ProlongDiamond with DAPI (Molecular probes). Imaging was performed using a DeltaVision Elite inverted microscope system (Applied Precision), using a 60x objective (numerical aperture 1.42) from Olympus or a Zeiss LSM 800 microscope using a Plan-Apochromat 63x/1.40 Oil objective. DSBs in the U-2OS reporter cells were induced by activating the ER-mCherry-LacI-FokI-DD with Shield-1 ligand (250 nM) and 4-OHT (500 nM) for 4 hr. Transcription was induced from the integrated reporter gene by treating the cells with 1 μg/ml doxycycline (DOX) for 3 hr. Where indicated, ATM inhibitor was applied 30 min before the addition of DOX. For 5-EU and RNAPII Ser2 staining, U-2OS cells were subjected to laser-microirradiation. 5-ethynyl uridine (5-EU) was added to the media immediately after laser treatment to a final concentration of 1 mM followed by incubation at 37°C for 1 hr. Incorporation of 5-EU was detected by Click-iT RNA imaging kit (Invitrogen) following manufacturer’s instructions. Samples were further processed for γH2A.X staining. Alternatively, laser treated samples were fixed 20 min after damage induction and stained with an antibody against RNAPII (phospho-Serine 2) or γH2A.X. Relative fluorescence values were calculated by measuring 5-EU or RNAPII Ser2 signal intensities along the laser track highlighted by the γH2A.X staining and compared with undamaged regions of the nucleus using ImageJ as shown in Figure 4—figure supplement 1B. BrDU incorporation and Propodium Iodide staining was performed essentially as described in (Clijsters et al., 2013). Briefly, U-2OS cells were pulse-labelled with 10 μM BrdU (Merck) for 30 min followed by trypsinization and overnight fixation in ice-cold 70% ethanol. After washing with PBS and then with 1% BSA, 0.05% Triton X-100 in PBS (PBST-BSA), DNA was denatured for 20 min with 2 N HCl, 0.5% Triton X-100. Cells were washed with PBS, and resuspended in sodium tetraborate (0.1 M, pH 8.5) for 5 min. Cells were incubated with anti-BrdU antibody (1:100, DAKO) in PBST-BSA for 1 hr at RT. After washing, Alexa Fluor-488 coupled goat anti-mouse (1:500, Molecular Probes) secondary antibody was added in PBST-BSA for 30 min at RT. After several washes, cells were resuspended in PBST-BSA with propidium iodide (10 μg/mL, Invitrogen) and RNase A (20 μg/mL, Invitrogen). Cell cycle analysis was carried out by flow cytometry with a BD FACSCalibur Cell Analyzer and FlowJo (RRID:SCR_008520) software. I-SceI-based reporter assays were used to measure the efficiency of repair by HR and NHEJ pathways (Bennardo et al., 2008; Gunn and Stark, 2012; Pierce et al., 1999). DR-GFP-U-2OS cells, from The M. Jasin Lab, were used for HR assays, and EJ5-U-2OS cells, from The J. Stark Lab, were used for NHEJ assays. Cells were grown in six well dishes and were transfected with siRNA oligos using RNAiMax (ThermoFisher Scientific) according to manufacturer’s specifications. The following day, cells were transfected with 1 μg of the I-SceI-GR-RFP plasmid (a gift from Tom Misteli, Addgene # 17654, RRID:SCR_002037) using Lipofectamine 3000. Cells were subjected to a second round of siRNA silencing. To induce I-SceI-GR-RFP expression, cells were treated with 0.2 μM triamcinolone acetonide (TCA, Sigma-Aldrich) for 48 hr. Flow cytometry analysis was performed using a BD LSR II HTS Analyzer (RRID:SCR_002159). The percentages of RFP positive cells that were also GFP positive were quantified. MIA-PaCa-2 cells were silenced with the indicated siRNAs for 2 rounds for 72 hr. Cells were then plated in triplicates at densities of 2000 cells per 96 well plate and incubated for 24 hr before exposure to various doses of NCS. After 72 hr, AlamarBlue assay (BioRad) was used to measure the metabolic activity of cells according to the manufacturer's instructions. Data were analyzed using GraphPad Prism 7.03 software (RRID:SCR_002798). Two-group datasets were analyzed using the nonparametric Mann-Whitney test unless otherwise stated. For comparisons between three or more groups, parametric or non-parametric one-way analysis of variance (ANOVA) was used. Samples were prepared as in Immunofluorescence microscopy using Alexa Fluor-568 and Alexa Fluor-647 as secondary antibodies. The dSTORM imaging was performed on a custom-built optical imaging platform based on an inverted microscope (Leica DMA 300) (Chen et al., 2015). The microscope was equipped with 561 nm (200 mW, UltraLasers, MGL-FN-561–200), and 640 nm (150 mW, OEM Laser systems, MLL-III-150) laser lines, as well as a CORR total reflection objective (Zeiss, 100X, NA = 1.47, HCX PL APO). The two laser lines were collimated and reflected by a penta-edge dichroic beam splitter (Semrock, 408/504/581/667/762-Di01−22 × 29). Cell samples were excited in Highly inclined and Laminated Optical sheet (HILO) illumination mode (Tokunaga et al., 2008). A 405 nm laser line (100 mW, Applied Scientific Pro., MDL-III-100) was employed to enhance photoswitching of fluorophores. For two-color dSTORM imaging, Alexa Fluor-568 and Alexa Fluor-647 were sequentially illuminated and their emitted fluorescence were sequentially collected by a (a bandpass filter 676/37 (Semrock) for Alexa Fluor 647, and a bandpass filter 607/36 (Semrock) for Alexa Fluor 568. The photons were recorded by a sCMOS camera (Prime 95B, Photometrics). The two colors were aligned by matching the wide-spectrum fluorescent beads (diameter = 100 nm, TetraSpec, T7279) via a third order polynomial algorithm. The two single-band pass filters for different fluorophores were switched via a filter wheel (FW102C, Thorlabs). 2000 frames per image for both colors were recorded at a frequency of 33 Hz. The imaging buffer, composed of an oxygen scavenging system (1 mg/mL glucose oxidase, 0.02 mg/mL catalase, and 10% glucose in PBS) and 100 mM cycteamine (MEA), was freshly mixed before injection onto the sample coverslips. Single-molecule image stacks were reconstructed by fitting each single-molecule event into a 2D Gaussian Point Spread Function (PSF) and recording the successively fitted central coordinates of the PSFs. Briefly, each 2D Gaussian PSF was fitted using the Maximum-Likelihood Estimation algorithm, with the characteristics of each individual camera pixel (modeled as a Gaussian distribution) considered (Huang et al., 2013). Each fitting was evaluated by its Log-Likelihood Ratio (LLR) against the null-hypothesis, and the insignificant fittings (at 0.05 level) were discarded. Each fitting accuracy (precision) was given by its Cramér-Rao Lower Bound (CRLB). The frequency of each fitting accuracy was then counted, and its histogram was fitted into a skewed Gaussian function, of which the center was given as an average fitting accuracy. In this work, the fitting accuracy of Alexa Fluor-647 is ~8 nm, and that of Alexa Fluor-568 is ~10 nm. The recorded coordinates were then rendered into images of 10 nm/pixel or 5 nm/pixel for display or correlation analysis purposes, respectively. Briefly, fitted coordinates of each PSF center were rendered into two-color images of 5 nm/pixel. An 8 × 8 μm2 square was then cropped from the center of one nucleus image. The two colors of the square were then split into separate binary images (2D arrays) for cross-pair-correlation analysis. where ⟨KR⟩ denotes the ensemble average across each pixel R, and ρx(R)=1 (or ρx(R)=0) describes whether there is (or not) a single-molecule event detected in the xth Channel at pixel R . ρx=⟨ρx(R)⟩R=Nx/S. denotes the averaged density of all the single-molecule events, where Nx is the number of single-molecule events on the canvas of size S. In practice, the correlation function was calculated based on the Fourier Transform theorems and the Matlab (MathWorks Inc.) built-in 2D Fast-Fourier-Transform (FFT) functions (fft2, ifft2). The calculated correlation function was then transferred from cartesian to polar coordinates, and radially averaged through [0,2π]. It was then fitted into a 1D Gaussian function, and the amplitude was read out as the descriptive correlation strength. We note that the correlation length (distance) describes a spatial range within which the correlation between the two species becomes significant as compared to the random colocalizations. It cannot be considered as a measure of the absolute center-to-center distance between two molecules. The pair-cross-correlation was performed to robustly map the colocalization between tested samples. We note that this pair-cross-correlation collects the pairwise distances between two species and computes their probability density in the spatial frequency domain. The false positive (random) colocalization events that are caused by the sample’s dense distributions in the nucleus, therefore, only contribute as the denominator, so that the pair-cross-correlation demonstrates the relative amount of significant (true positive) colocalization events versus the overall (true positive + false positive) colocalization observations. Representatives images were smoothed, thresholded, and binarized before they were overlapped. We note that these post-imaging procedures are for display purpose. The correlation analysis was performed directly on the reconstructed raw coordinates and did not include these post-processing artifacts. Antioxidants & Redox Signaling 20:621–639. The Journal of Cell Biology 202:579–595. The Journal of Cell Biology 201:1013–1026. Current Opinion in Structural Biology 28:112–121. Nature Structural & Molecular Biology 20:1147–1155. Molecular and Cellular Biology 31:1972–1982. The Journal of Cell Biology 216:1959–1974. The Journal of Cell Biology 213:185–200. Biochemistry and Cell Biology = Biochimie Et Biologie Cellulaire 84:528–535. Journal of Biological Chemistry 290:4163–4177. The Journal of Cell Biology 191:45–60. International Journal of Molecular Sciences 18:1486.
International Journal of Radiation Oncology*Biology*Physics 89:736–744. Molecular and Cellular Biology 23:3974–3981. Journal of Biological Chemistry 286:28599–28607. Molecular and Cellular Biology 27:6457–6468. Nature Reviews Molecular Cell Biology 17:379–394. Molecular Biology of the Cell 27:3791–3799. Journal of Biological Chemistry 291:1789–1802. Molecular & Cellular Proteomics 6:820–834. Nature Structural & Molecular Biology 20:317–325. Journal of Cell Science 122:4070–4080. Thank you for submitting your work entitled "PARP1-dependent recruitment of the FBXL10-RNF68-RNF2 ubiquitin ligase to sites of DNA damage controls H2A.Z loading" for consideration by eLife. Your article has been reviewed by three peer reviewers, one of whom is a member of our Board of Reviewing Editors, and the evaluation has been overseen by a Senior Editor. The reviewers have opted to remain anonymous. Our decision has been reached after consultation between the reviewers. Based on these discussions and the individual reviews below, we regret to inform you that your work will not be considered further for publication in eLife. However, we agree that this is a paper of interest for eLife in the future if the main concerns raised are appropriately responded to with additional experiments. 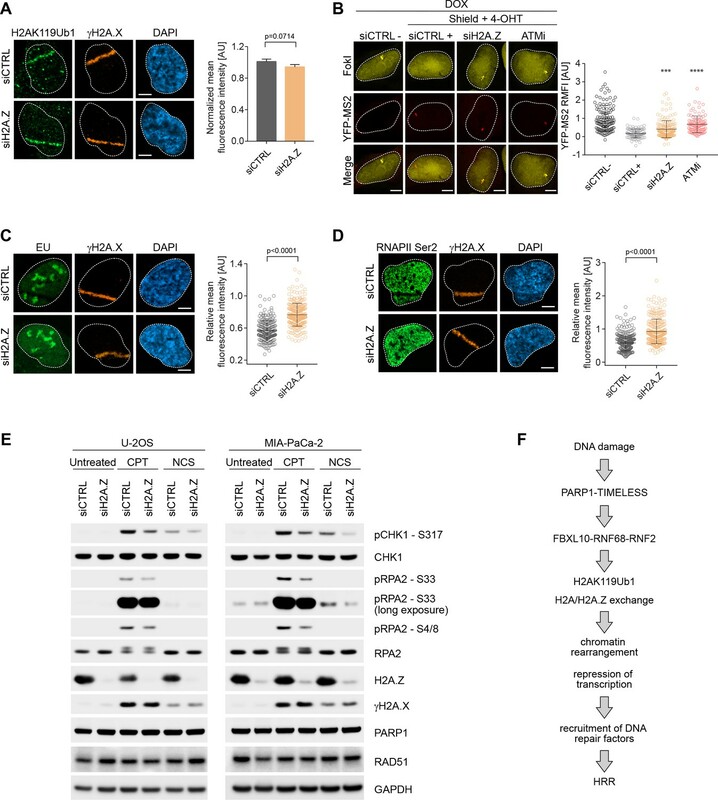 This manuscript describes a series of complex and high-quality experiments using a varied combination of cell biology and molecular biology approaches to conclude that the core ubiquitin ligase subcomplex of the ncPRC1.1 Polycomb repressive complex formed by FBXL10, RNF2 and RNF68 is recruited to DNA double strand breaks in a PARP1 and TIMELESS dependent manner. Recruitment is accompanied by mono-ubiquitylation of H2A K119, consistent with the activity of the FBXL10-RNF2-RNF68 complex, and a reduction of H2A density that is accompanied by an increase of H2AZ. As a consequence of these changes, transcription is reduced at the site of damage. Finally, the authors show that FBXL10-RNF2-RNF68 is required for efficient homologous recombination repair of the DSB. The study thus provides a general picture of the control of HR DSB repair by FBXL10-RNF68-RNF2 complex in a PARP1 and TIMELESS-dependent manner, but a mechanistic insight of how this complex promotes H2AZ incorporation is lacking. Despite the potential and interest of the work for eLife, the H2A.Z part, critical for the novelty of the manuscript, should be developed further. It would be essential to figure out the connection between ncPRC and cPRC and H2AZ deposition. Additionally, the STORM data does not seem sufficiently valid as it is and needs additional work to show the claims. More specific comments can be found in the individual reviews attached below. This is a nice manuscript describing a series of complex and high-quality experiments using a varied combination of cell biology and molecular biology approaches to conclude that the core ubiquitin ligase subcomplex of the ncPRC1.1 Polycomb repressive complex formed by FBXL10, RNF2 and RNF68 is recruited to DNA double strand breaks in a PARP1 and TIMELESS dependent manner. Using the powerful technology of STORM, the authors first show using neocarzinostatin to generate breaks a rapid recruitment to damages and confirm this result using a known fusion construct of the Fok1 endonuclease that cleaves specifically to a lacO repeated region of a modified U2OS line. This action is specific for this complex as the FBXL11 paralog of FBXL10, which is not part of the ncPRC1.1 complex, does not recruit to the damage. 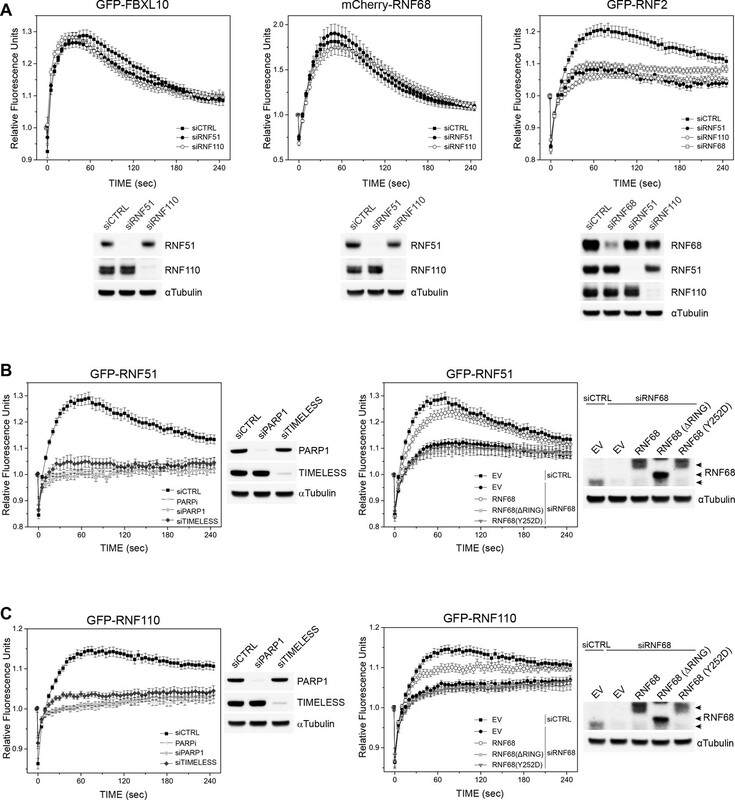 Authors show that recruitment is dependent on PARylation by using the PARP1 inhibitor Olaparib and by knocking down PARP1 and TIMELESS in the cells. The reaction is accompanied by mono-ubiquitylation of H2A K119, consistent with the activity of the complex, and a reduction of H2A density that is accompanied by an increase of H2AZ. As a consequence of these changes, authors are able to show that transcription is reduced at the site of damage as determined by 5-EU global labeling of RNA as well as specific system based on a reporter containing MS2stem loop repeats to visualize transcription directly at the transcription site. Concomitantly they see a lower Ser2P RNAPII, consistent with lower transcription elongation efficiency. Analysis of the impact of depleting a number of homologous recombination and DSB-signals (RAD51, BRCA1, CHK1 phosphorylation) authors provide evidence that depletion of FBXL10-RNF2-RNF68 reduces homologous recombination. Finally the authors identify the minimal region required of four amino acids of RNF68 required for stable binding with FBXL10 and show by generating mutants like RNF68Y252D, which reduces binding to FBXL10 but not to RNF2, and mutants deleting the RING domain of RNF68, which did not affect FBXL10 binding but it did RNF2 binding, that disruption of the complex affects recruitment of recombination factors to the breaks. Recombination was assayed with the I-SceI DSB system of M. Jasin to corroborate functional meaning of the results, providing evidence that this is at least in part due to the replacement of H2A by H2AZ at the site of the DSB promoted by the FBXL10-RNF68-RNF2 complex. Therefore, the manuscript provides an important regulatory step of DSB repair via homologous recombination that is controlled by the FBXL10-RNF68-RNF2 complex in a PARP1 and TIMELESS-dependent manner. The study manages to integrate this specific function with a role of chromatin dynamics in transcription repression at the site of damage and recombination enhancement as a DSB repair pathway. Authors make interesting proposals in their Discussion that would certainly need to be tested with further experiments. For example, it in the future would be nice to know how the FBXL10-RNF68-RNF2 complex affect DSB resection, and other aspects. However, having said this, this is manuscript seems suitable for eLife. This manuscript from Pagano and colleagues reports a role for a non-canonical PRC1 complex, consisting of Fbxl10, Rnf2, and Rnf68 in the DNA double strand break (DSB) response. They show by STORM imaging that the complex localizes to DSBs and that is facilitates ubiquitination of H2A on K119, although it is unclear if this ubiquitination is direct, or mediated by the recruitment of a second E3 ubiquitin ligase. Further they show that the complex represses transcription at sites of DNA damage, and that this facilitates incorporation of H2A.Z and ultimately in successful homologous recombination repair. Overall, the manuscript is well written and the data is of the highest quality. 1) STORM imaging suggests that the entire complex is localized to DNA damage repair sites in response to NCS. In previous studies these authors have shown the number of overlaps per nuclei with and without damage (PNAS 2015). They should do the same thing here to further convince readers that the overlap is real, particularly in light of the fact that this is a non-conventional way of showing these correlations that many readers will be unfamiliar with. 2) In Figure 1—figure supplement 2 the authors show GFP tagged components forming foci in response to damage ("damage spots"), although all of these proteins are forming foci without damage and it is unclear if these proteins would blink on and off with no treatment. How do the authors know these are sites of DNA damage? This should be addressed. 3) The authors show that ATM inhibition restores active transcription at sites of DNA damage. This result is consistent with data from Shanbhag et al. (2010) showing that ATM is required to repress transcription at sites of DNA damage. However, they also show that ATM inhibition has no effect on the localization of Fbxl10, Rnf2, and Rnf68. Thus, it is unclear how ATM inhibition is repressing transcription if the Fbxl10 complex is still localized. The authors should provide some explanation for how this might occur. 4) In Figures 5 and 6 the authors make the argument that the role of this complex is dependent on deposition of H2A.Z at sites of damage. They should again quantify the number of overlaps per cell. 5) It is unclear what the timing of H2A.Z deposition is in relation to that of Fbxl10, Rnf2, and Rnf68. The latter cycles through break sites very early (within minutes), well before the deposition of Rad51 onto single stranded DNA. 6) It is also unclear how H2A.Z is being deposited, just that it depends on Fbxl10, Rnf2, and Rnf68. Therefore, this section of the manuscript feels mis-placed and premature. While it appears that H2a.Z is implicated in the DNA damage response and HRR, it is unclear how or why, and how this is connected to Fbxl10, Rnf2, and Rnf68, just that there exists a dependency. The manuscript entitled "PARP1-dependent recruitment of the FBXL10-RNF68-RNF2 ubiquitin ligase to sites of DNA damage controls H2A.Z loading" by Pagano et al., describes the role of the non-canonical PRC1 complex FBXL10-RNF68-RNF2 in DNA damage response and repair via transcription repression and H2AZ exchange at sites of DNA damage. The authors report that this ncPRC1.1 complex, which is recruited in a PARP dependent manner, mediates H2AK119Ub and promotes HR repair. The experiments performed using depletion of the individual subunits of the complex suggests the involvement of these proteins in DNA damage responses. However, functional importance of this complex, for instance, a mechanistic insight of how this complex promotes H2AZ incorporation is lacking. In addition, given the published literature on the canonical PRC1 complex being involved in transcriptional repression at DNA damage sites (ex. Sanchez et al., 2016), it is critical to determine whether the reported non-canonical PRC1 complex works in the same pathway or delineate the interplay between canonical PRC1 complex activity at damage sites and this non-canonical PRC1 complex. As is, this story is rather descriptive and lacks mechanistic insights. 1) In Figure 1, it is unclear why the untreated U2OS cells (-NCS) also show high levels of XRCC5. FBXL10, RNF68, RNF2 recruitment are shown to be PARP1 and TIMELESS dependent manner but it is unclear if this complex works collectively. Given that these proteins are involved in other complexes known to be recruited to chromatin, are FBXL10, RNF68 and RNF2 DSB recruitment interdependent or independent of each other? How do these proteins affect the canonical PRC complexes? It will also be informative to check for the recruitment of FBXL10, RNF68, RNF2 in the RNF68 RING domain and Y252D mutant. - The authors mention that RNF2 remains at DNA lesions longer likely because of its presence in canonical and ncPRC complex. RNF2 is known to interact with BMI1 that has been shown to recruit and be retained at DSBs for several hours. It would be interesting to check if depletion of BMI1 affects RNF2 recruitment kinetics in this context. - It is reported that only PARP1 and TIMELESS completely abrogate FBXL10, RNF68 and RNF2 DSB recruitment but from Figure 1—figure supplement.2D it is clear that ATM kinase inhibition shows strong DSB recruitment and retention (RNF68 in particular). Is there an explanation for this result? 2) In Figure 2, it is shown that depletion of FBXL10, RNF68 and RNF2 reduces H2A K119Ub1 suggesting FBXL10-RNF68-RNF2 as the E3 ligase complex. However it has been previously reported that H2AK119Ub1 at DNA damage site is mediated by BMI1-RNF2 that makes it unclear about the specificity of this ncPRC1 at the level of the core PRC complexes. The authors show that FBXL10-RNF68-RNF2 is recruited early in the DNA damage response. On the other hand BMI1 is recruited later in the DDR. It will be interesting to check if FBXL10-RNF68-RNF2 mediates the first wave of H2AK119ub1 while BMI1-RNF2 mediates subsequent H2AK119Ub1. Moreover, it will be also useful to check for H2AK119Ub1 in RNF68 RING domain and Y252D mutants. 3) It would be appropriate to show a comparison of H2A/H2AX119Ub -/+ DNA damage in Control vs. FBXL10, RNF68 and RNF2 deficient cells by western blot. 4) There is a possibility that depletion of FBXL10-RNF68-RNF2 affects other histone ubiquitylation marks in DDR given that in Figure 4A-B, reduction in polyubiquitin signal (FK2) was observed. It is unclear if other such Ub marks on histones were analyzed in this study. DNA damage induced ubiquitin foci (detected by FK2) are formed mostly by RNF8 and RNF168. Do the authors suggest that FBXL10-RNF68-RNF2 works upstream or negatively affects RNF8 and RNF168 or its substrates and if so how? It will be interesting to check if FBXL10-RNF68-RNF2 affects RNF8 recruitment or vice versa. 5) It is important to perform cell survival assays in the context of DDR as previous reports state that RNF2 reduces cell viability and promotes cell cycle arrest. 6) It is unclear whether the demethylation activity of Fbxl10 is involved in its role in the DDR demonstrated in this article i.e., H2AK119ub1, transcriptional repression, 53BP1 and RAD51 recruitment? Demethylation of H3K4me3 has been shown to be involved in these pathways so this is worth considering. 7) It should be explained why there are phenotypical differences observed when depleting FBXL10, RNF68 and RNF2 if these form a functional complex. For example, why FBXL10 shows NHEJ defects while the other members do not? Moreover, another piece of work has previously reported that loss of H2AZ decreases Ku-loading and NHEJ but this doesn't fit well with the experimental results shown here (Price and colleagues, Mol Cell, 2012). There is no mechanistic insights for how this complex promotes H2AZ accumulation at damage sites. From the IF images, clearly most H2AZ incorporation is not affected by these proteins (see comment 9). Most studies need to be performed to understand these preliminary data. 8) Complementation studies are missing, which could significantly strengthen the data. 9) It would be appropriate to include the focal accumulation images of the DDR repair factors along with the quantification shown in Figure 4. Instead of representing the% cells with foci, the number of foci per cell would be more informative. The microscopy data presented for high resolution has some major issues. As colocalization is used, it is unclear if these proteins really accumulate at IR induced damage sites or if this is just due to the increased signal obtained by KU or phosphH2AX. If you look at just the signal of the non-canonical PRC1 proteins, it is unclear if the signals increase and/or the number of foci change. These parameters must be analyzed to ensure that this technique is not an artifact of the system and how these data are being presented. As is, these data are not convincing. […] 1) STORM imaging suggests that the entire complex is localized to DNA damage repair sites in response to NCS. In previous studies these authors have shown the number of overlaps per nuclei with and without damage (PNAS 2015). They should do the same thing here to further convince readers that the overlap is real, particularly in light of the fact that this is a non-conventional way of showing these correlations that many readers will be unfamiliar with. Figure 1A shows representative overlaps between FBXL10, RNF68, or RNF2 and XRCC5, with or without NCS treatment. However, as now mentioned in the manuscript, in dense images, it is possible that two species randomly overlap with each other. Therefore, we analyzed all images using a cross-correlation method that probes the probability distributions across all possible pair-wise distances between two species taking in account, at the same time, the amount of each species (PMIDs: 25179006, 23717596, 22384026 and 27545293). Briefly, if two species are randomly distributed from each other, the probability should be the same at all distances (i.e., the probability should be flat if visualized as a function of the pairwise distances). In contrast, if the two species have intrinsic spatial correlation at a certain distance, the correlation function will display a significant probability distribution at such certain distance (although such correlations are not easily seen because of their stochastic and dense distributions). We have now explained in more detail in the text the benefit of using super-resolution microscopy and the way data was analyzed. Moreover, we have now also used confocal microscopy as an orthogonal method to show the enrichment of the endogenous FBXL10-RNF68-RNF2 ubiquitin ligase complex (FRRUC) at sites of DNA damage (new Figure 1—figure supplement 1B). The damage spots are only those indicated by the white dotted lines (these are the spots we hit with the laser prior to live imaging). The other large spots in cells expressing FBXL10 and RNF68 are nucleoli. FBXL10 is known to predominantly localize to the nucleolus (PMIDs: 17994099 and 19852816). Our data show that RNF68 displays a similar localization, while RNF2, which is present in several protein complexes, has a more homogenous distribution. Many nucleolar proteins involved in the DNA damage response are sequestered in the nucleolus (PMIDs: 29429989, 23879289, etc.). The FRRUC is recruited to DNA lesion independently of ATM (Figure 1—figure supplement 2D). Thus, they seem to function in parallel pathways and, in fact, ATM seems to have an inhibitory role on the recruitment of the FRRUC. ATM might limit the spread of the FRRUC and the subsequent H2A mono-ubiquitylation to maintain the signal at DSB proximities. We now discuss this point (Discussion, fifth paragraph). Please see our reply to point #1. H2A.Z recruitment is detectable within two minutes after DSB induction and is removed within 10 minutes (PMIDs: 26142279 and 26034280). Unfortunately, we were unable to show H2A.Z recruitment to laser damage, possibly because of the very dense H2A.Z staining. However, we were able to show H2A.Z recruitment by both ChIP and super-resolution microscopy (Figure 6A-C). Interestingly, a recent paper measured the kinetics of recruitment of 70 DNA repair proteins to laser-induced DNA damage sites in HeLa cells (PMID: 29547717). Compared to the recruitment of these 70 proteins, FBXL10, RNF68, and RNF2 display a very fast recruitment while RAD51’s peak of recruitment is about 18 minutes. The rapid recruitment of the FRRUC suggests that this represent one of the most upstream events in response to genotoxic stress, affecting many downstream events of which some directly and others indirectly. We have now gained mechanistic insights into how the FRRUC promotes the recruitment of H2A.Z (new Figure 6F and new Figure 6—figure supplement 1G-I). Specifically, we now provide evidence that, whereas H2A.Z is not required for H2A mono-ubiquitylation, the latter is directly necessary for the enrichment of H2A.Z at DNA damage sites. To reach this conclusion, we utilized a strategy used by a landmark Cell paper on DNA damage-induced transcription repression (PMID: 20550933). As in this study, either wild-type H2A or H2A(K119/120R), an H2A mutant in which Lys119 and Lys120 were mutated to arginines, were overexpressed in the reporter cells expressing inducible FokI. We observed a reduction in H2A.Z loading at DSBs in cells overexpressing H2A(K119/120R) compared to cells overexpressing wild-type H2A (new Figure 6F). This is in agreement with the fact that only wild-type RNF68 (able to sustain H2A mono-ubiquitylation), but not two inactive RNF68 mutants, rescues the defect of H2A.Z loading (Figure 6E), and indicates that the FRRUC-dependent mono-ubiquitylation of H2A is required for proper H2A.Z loading. In contrast, the chaperones that contribute to H2A.Z loading (i.e., TIP48 and TIP49) are not controlled by the FRRUC (Figure 6—figure supplement 1G-H). H2A.Z loading has been previously shown to be involved in DNA repair mechanisms. We further show that H2A.Z loading depends on the FRRUC and contributes to transcriptional repression and the DDR (Figures 6 and 7). How H2A.Z recruitment is involved in transcriptional repression is currently unclear. But this is true also for modifications that are commonly accepted to be necessary for transcriptional repression. For example, H2A mono-ubiquitylation is thought to repress transcription; however, how mono-ubiquitylation of histones mechanistically controls downstream effects (such as nucleosome rearrangements and chromatin remodeling) remains a big, black box in both the field of DNA damage and the field of transcription. 1) In Figure 1, it is unclear why the untreated U2OS cells (-NCS) also show high levels of XRCC5. XRCC5 protein levels do not change after DNA damage, only its localization. XRCC5 is a highly abundant protein that is rapidly recruited to DSBs since, although it has intrinsic affinity for DNA, it has even higher affinity for DNA ends. Because it associates with chromatin in both undamaged and damaged cells (although at different locations under these two conditions), XRCC5 is an ideal marker to evaluate cross-correlation changes with other DNA-binding proteins in response to DNA damage (PMIDs: 23897892, 25941401, 29215009, 11493912). We have now clarified the main text. FBXL10, RNF68, RNF2 recruitment are shown to be PARP1 and TIMELESS dependent manner but it is unclear if this complex works collectively. Given that these proteins are involved in other complexes known to be recruited to chromatin, are FBXL10, RNF68 and RNF2 DSB recruitment interdependent or independent of each other? The hierarchical nature of the FBXL10-RNF68-RNF2 ubiquitin ligase complex (FRRUC) has been well established using both structural biology and biochemical approaches: its chromatin recruitment depends on FBXL10, which recruits RNF68, which, in turn, recruits RNF2 (PMIDs: 27568929, 23523425, 24856970, 23256043, 23502314, 23395003). Accordingly, silencing of FBXL10 impairs the recruitment of RNF68 and to some extent RNF2 (see Author response image 1), the latter also being recruited via the cPRC1. Moreover, we confirm that FBXL10, RNF68, and RNF2 form a trimeric complex using sequential immunoprecipitations (new Figure 1—figure supplement 1A). U2OS cells were transfected with the indicated siRNAs. After 72 h, cells were treated with NCS for 20 minutes. After harvesting, cells were fractionated into soluble and chromatin fractions, and lysates were immunoblotted as indicated. For chromatin fractionation, cells were pre-extracted with CSK buffer (D’Angiolella et al., 2010) for 10 minutes on ice and centrifuged for 3 min at 3000 g. The insoluble pellets were digested with TurboNuclease in the presence of 250 mM NaCl to generate the chromatin fraction. Asterisks denote unspecific bands. How do these proteins affect the canonical PRC complexes? It will also be informative to check for the recruitment of FBXL10, RNF68, RNF2 in the RNF68 RING domain and Y252D mutant. We have now included data on the recruitment of RNF51 (AKA BMI1 or PCGF4) and RNF110 (AKA MEL18 or PCGF2), which are components of cPRC1 complexes, and found a dependence on PARP1 and TIMELESS (new Figure 2B-C and new Figure 2—figure supplement 1B). Notably, their recruitment is inhibited when RNF68 is depleted. Wild-type RNF68, but not RNF68 inactive mutants, rescue this phenotype (new Figure 2B-C). In contrast, recruitment of FBXL10 and RNF68 is not affected by the silencing of either RNF51 or RNF110 (new Figure 2A and new Figure 2—figure supplement 1A). Thus, it appears that the FRRUC is necessary for the proper recruitment of the cPRC1 complexes to DNA lesions. 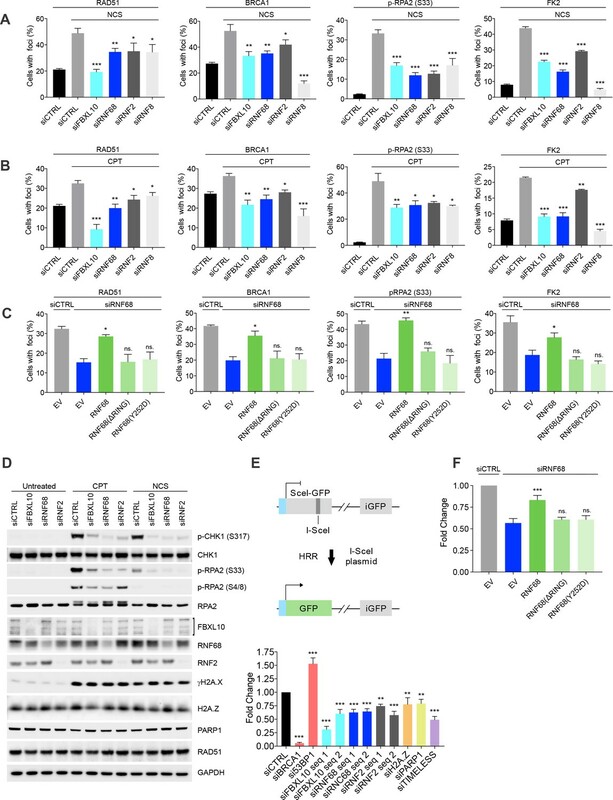 - It is reported that only PARP1 and TIMELESS completely abrogate FBXL10, RNF68 and RNF2 DSB recruitment but from Figure 1—figure supplement 2D it is clear that ATM kinase inhibition shows strong DSB recruitment and retention (RNF68 in particular). Is there an explanation for this result? ATM might limit the spread of the FRRUC and the subsequent H2A mono-ubiquitylation to maintain the signal at DSB proximities. We now discuss this point (Discussion, fifth paragraph). It appears that the FRRUC is necessary for the proper recruitment of the cPRC1 complexes to DNA lesions (new Figure 2 and new Figure 2—figure supplement 1-2). See point #1 for details. H2AK119Ub1 is a widespread epigenetic marker modulating transcription in unperturbed cells. Upon DNA damage, this signal is locally enriched at DNA damage sites. We were unable to reliably show this local enrichment by immunoblotting, thus, we have not included these results in the manuscript. However, we have shown the local enrichment of H2AK119Ub1 with two independent methods: (i) using local laser micro-irradiation and immunofluorescence staining (Figure 3A-B) and (ii) by ChIP analysis at locally introduced DSBs using a nuclease (Figure 3C). 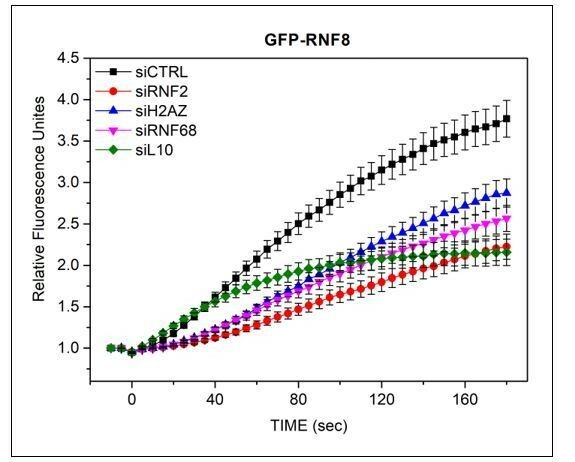 As the reviewer suggested, we have measured the recruitment kinetics of GFP-RNF8 (Author response image 2). By 180 seconds, RNF8 had not reached its maximal level of recruitment. Silencing FBXL10, RNF68, or RNF2 negatively affected the recruitment of RNF8. The time of RNF8 recruitment is much slower than what we measure for the FRRUC, which is ~60 seconds. We believe that H2AK119Ub1 is one of the earliest markers of DSB and, therefore, it affects many late events (directly and indirectly), including the recruitment of RNF8. U-2OS cells stably expressing GFP-RNF8 (a kind gift from Dr D Durocher) were transfected with siRNAs targeting FBXL10, RNF68, RNF2 or H2A.Z, or a non-targeting control (CTRL). Cells were pre-sensitized with BrdU (10 μM) for 36 hours and subjected to 405 nm laser induced damage. DNA damage recruitment dynamics were captured by live cell imaging. Relative fluorescence values and images were acquired every 5 seconds for 3 minutes. For each condition, ≥25 cells were evaluated from 2 or 3 independent experiments. Mean relative fluorescence values and standard errors were plotted against time. We now show that the silencing of FBXL10, RNF68, or RNF2 sensitizes cells to DNA damage (new Figure 5—figure supplement 2F). FBXL10 display multiple splice isoforms, but the FRRUC within the ncPRC1.1 contains only a short isoform lacking the N-terminal JmjC histone demethylase domain (PMIDs: 25533466, 26687479, 17296600, 29502955, etc.). 7) It should be explained why there are phenotypical differences observed when depleting FBXL10, RNF68 and RNF2 if these form a functional complex. For example, why FBXL10 shows NHEJ defects while the other members do not? Moreover, another piece of work has previously reported that loss of H2AZ decreases Ku-loading and NHEJ but this doesn't fit well with the experimental results shown here (Price and colleagues, Mol Cell, 2012). Depletion of FBXL10 results in a reduction in NHEJ, in agreement with the reduction in 53BP1 foci (Figure 5—figure supplement 1A-B and Figure 5—figure supplement 2B-C), suggesting that FBXL10 may play a role in NHEJ, independently of RNF68 and RNF2. This is in agreement with the finding that FBXL10 (which has several isoforms and whose short isoform is the only one participating to the FRRUC) can participate in several protein complexes (PMID: 17296600). We have now better explained this in the text. Price and colleagues showed (PMID: 23122415) that H2A.Z incorporation is necessary for both HRR and NHEJ, as both pathways were significantly inhibited upon depletion of H2A.Z. Interestingly, in our hands we barely see a reduction in NHEJ repair efficiency upon depletion of H2A.Z (Figure 5—figure supplement 2E). There is no mechanistic insights for how this complex promotes H2AZ accumulation at damage sites. From the IF images, clearly most H2AZ incorporation is not affected by these proteins (see comment 9). Most studies need to be performed to understand these preliminary data. Figure 6A-B and D-E shows that H2A.Z incorporation is significantly reduced by the silencing of FBXL10, RNF68 or RNF2. We have now gained mechanistic insights into how the FRRUC promotes the recruitment of H2A.Z (new Figure 6F and new Figure 6—figure supplement 1G-I). Specifically, we now provide evidence that, whereas H2A.Z is not required for H2A mono-ubiquitylation, the latter is directly necessary for the enrichment of H2A.Z at DNA damage sites. To reach this conclusion, we utilized a strategy used by a landmark Cell paper on DNA damage-induced transcription repression (PMID: 20550933). As in this study, either wild-type H2A or H2A(K119/120R), an H2A mutant in which Lys119 and Lys120 were mutated to arginines, were overexpressed in the reporter cells expressing inducible FokI. We observed a reduction in H2A.Z loading at DSBs in cells overexpressing H2A(K119/120R) compared to cells overexpressing wild-type H2A (new Figure 6F). This is in agreement with the fact that only wild-type RNF68 (able to sustain H2A mono-ubiquitylation), but not two inactive RNF68 mutants, rescues the defect of H2A.Z loading (Figure 6E), and indicates that the FRRUC-dependent mono-ubiquitylation of H2A is required for proper H2A.Z loading. In contrast, the chaperones that contribute to H2A.Z loading (i.e., TIP48 and TIP49) are not controlled by the FRRUC (new Figure 6—figure supplement 1G-H). In order to control for off-target effects, we sought to rescue observed phenotypes by complementation of siRNA-resistant constructs. We used both wild-type RNF68 and inactive RNF68 mutants and complemented the phenotypes observed upon RNF68 silencing (new Figure 2B-C, new Figure 3B, Figure 5C and F, Figure 6E). We focused on rescuing the effect of RNF68 depletion since RNF68 is the subunit that defines the ncPRC1.1 complex (PMID: 23523425). Notably, we show that the entire FRRUC is needed for proper H2A.Z loading, DDR signaling and H2A mono-ubiquitination since the silencing of RNF68 could not be rescued with either a mutant unable to bind FBXL10 (Y252D) or a mutant that is not able to bind RNF2 (ΔRING) (Figure 5C and F, Figure 6E, new Figure 3B). 9) It would be appropriate to include the focal accumulation images of the DDR repair factors along with the quantification shown in Figure 4. Representative images for the focal accumulation of DDR repair factors were in the supplement (now in Figure 5—figure supplement 1A-B). Instead of representing the% cells with foci, the number of foci per cell would be more informative. The percentage of cells containing DNA-damage induced foci were evaluated as described in several landmark papers in the DNA damage field by normalizing to the basal level of genotoxic stress present in cultured cells (e.g., PMID: 20362325, 23333306, 26649820). Therefore, we believe that thresholding foci formation to a certain amount of foci of DDR foci per cell is a sensitive way to measure impairment in signaling pathway assembly. The microscopy data presented for high resolution has some major issues. 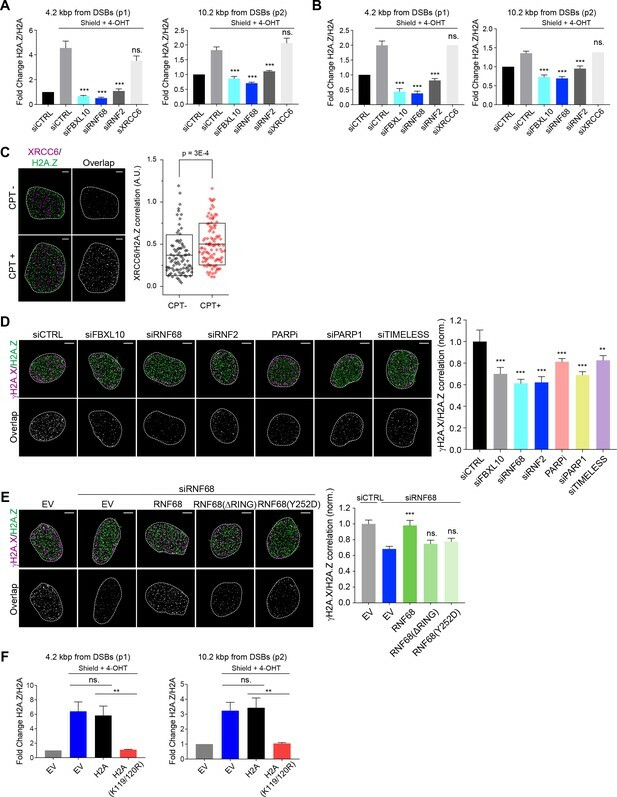 As colocalization is used, it is unclear if these proteins really accumulate at IR induced damage sites or if this is just due to the increased signal obtained by KU or phosphH2AX. If you look at just the signal of the non-canonical PRC1 proteins, it is unclear if the signals increase and/or the number of foci change. These parameters must be analyzed to ensure that this technique is not an artifact of the system and how these data are being presented. As is, these data are not convincing. We analyzed all super-resolution images using a cross-correlation method that probes the probability distributions across all possible pair-wise distances between two species taking in account, at the same time, the amount of each species (PMIDs: 25179006, 23717596, 22384026 and 27545293). Therefore, the given cross-correlation was already normalized by the amount of the species, to make sure the increase in cross-correlation signal is not due to the increase in the amount of either specie but their real co-localization probability density. In any case, in response to DNA damage, XRCC5 or FBXL10, RNF68 and RNF2 localize to DSB, but their levels do not change. Moreover, when we downregulate FBXL10, RNF68, or RNF2, we observe no changes in XRCC5 and phospho-H2A.X levels, compared to control cells (new Figure 3—figure supplement 1B, Figure 5D and new Figure 5—figure supplement 2A). We have now clarified the text. The authors thank R Greenberg, M Jasin, and J Stark for reagents; and D Durocher, R Greenberg, P Lee, J Lukas, Y Shiloh, and T Sixma for critically reading the manuscript. Authors are grateful to Chengbo Chen for the ImageJ scripts. MP is grateful to TM Thor and DR is greatful to S Perrotta for continuous support. This work was funded by a Rosztoczy Foundation Fellowship to GR, grants from the National Institutes of Health (R01-CA076584 and R01-GM057587) to MP, (R01-GM057691, R21-CA187612) to ER and the American Cancer Society grant (ACS 130304-RSG-16-241-01-DMC) to ER. © 2018, Rona et al.